Getting ready for spring. 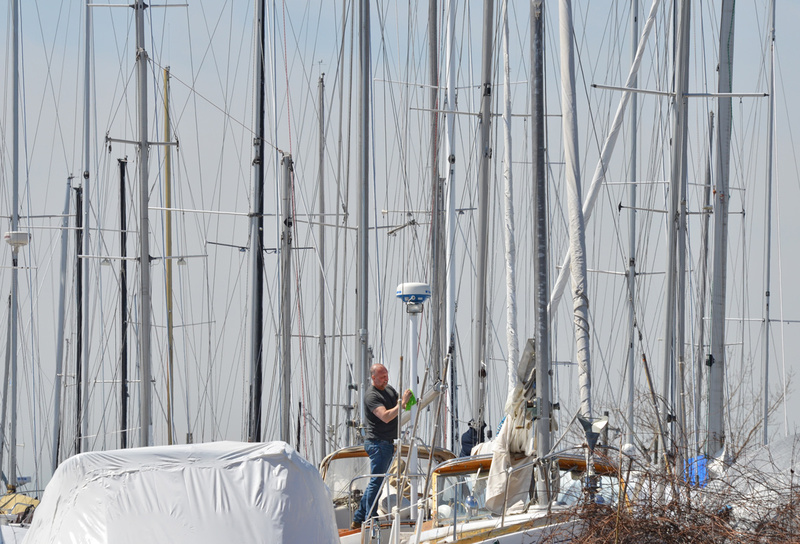 RCYC (Royal Canadian Yacht Club) is nearby. 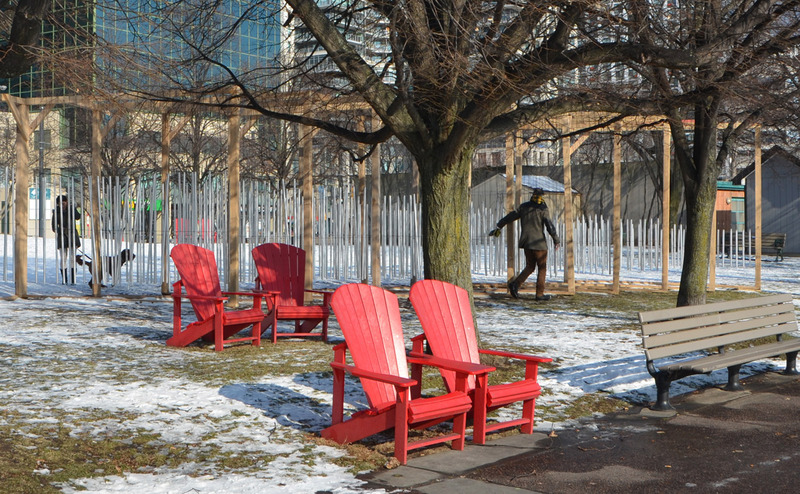 There are a few changes happening down at the Port Lands. 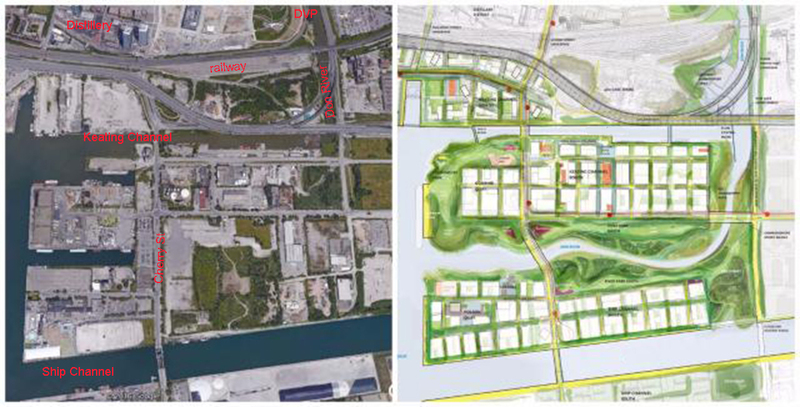 below: Aerial view of the present configuration of the Keating Channel, Don River, and part of the port lands beside a drawing of the planned changes. 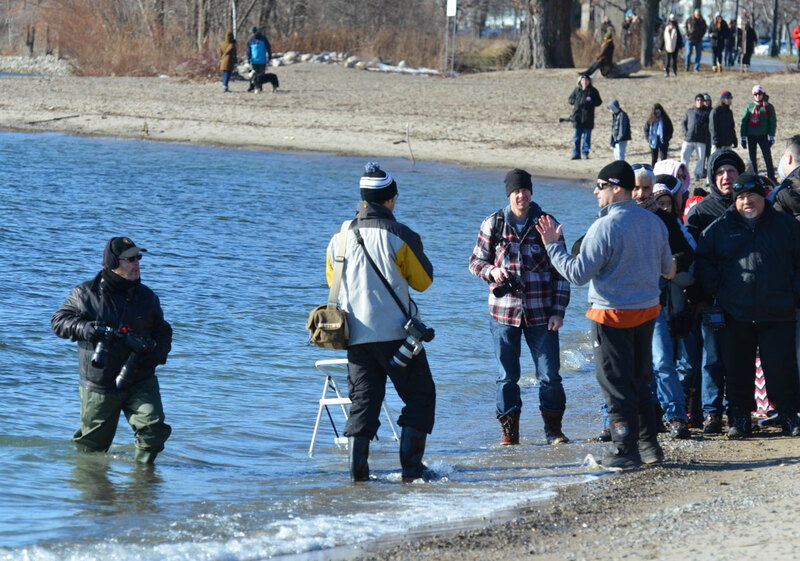 Rerouting the Don River will create an island, Villiers Island. In the 1880s, the lower part of the Don south of the former Winchester St. bridge (just north of Gerrard St) was straightened and the mouth of the river was placed in a channel to create additional harbour space and industrial dock space for boats in what is known as the Port Lands. This project was called the Don Improvement Project. The Don River now empties into the inner harbour through the Keating Channel. Lakeshore Blvd passes over the very south end of the river and because of its height (very low), boats can not enter the Don River. 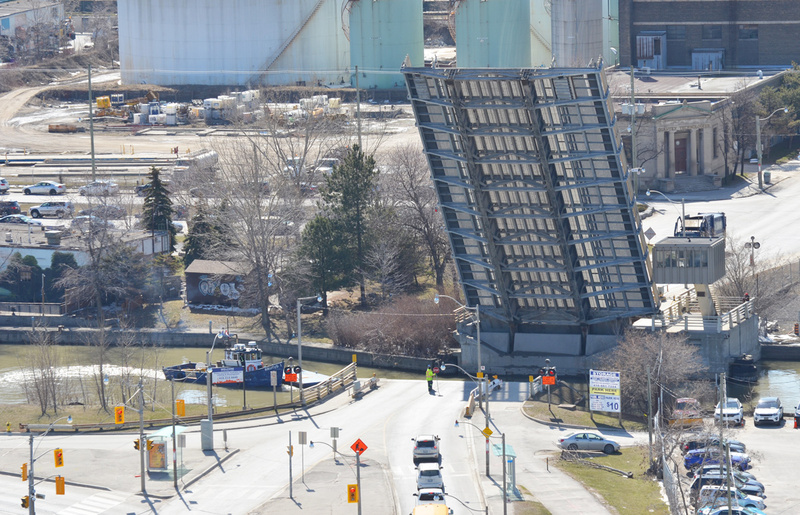 Boats may still enter the Keating Channel by going underneath a lift bridge at Cherry St. The straightening of the Lower Don also allowed for construction of the railway line parallel to it. 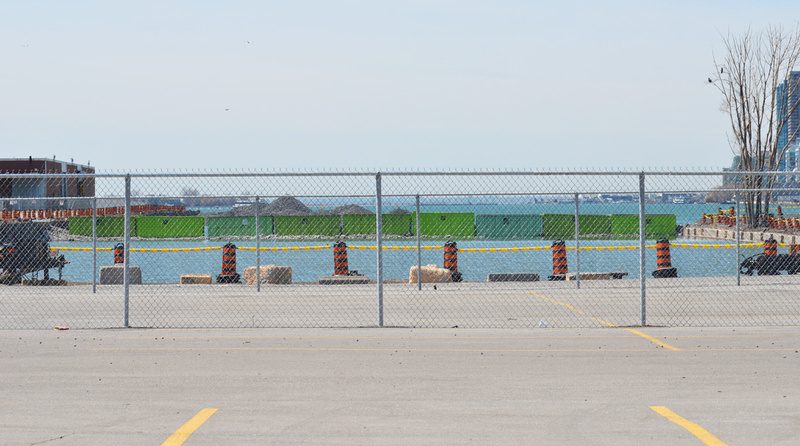 below: The cars are parked on vacant land between Lakeshore Blvd and Lake Ontario/Keating Channel. 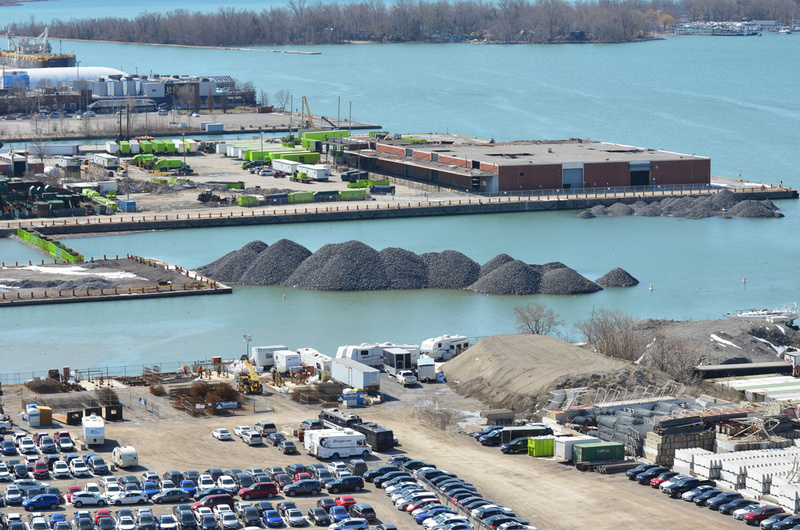 Mounds of gravel have been dumped off the end of Essroc Quay and beside Keating Channel. You might also have noticed the nine green bins that have been laid across the water (very left side of the photo). They too are full of gravel. 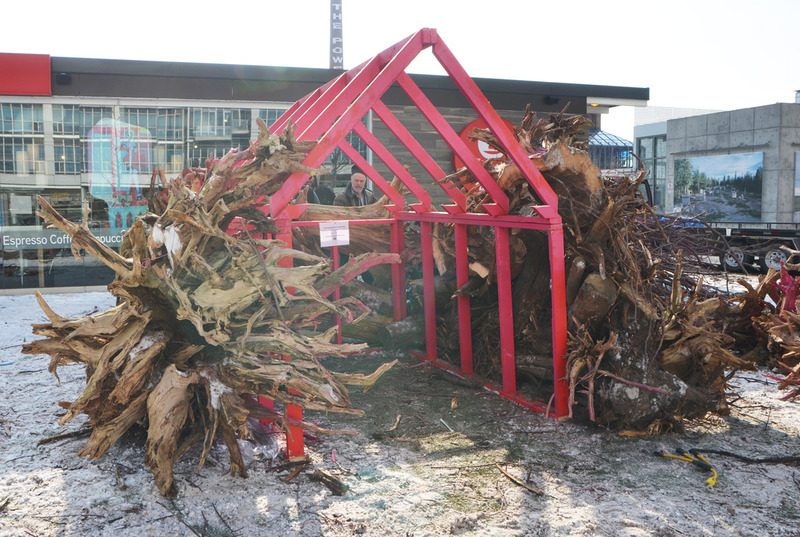 These are part of the beginning of the renovations of the port lands. 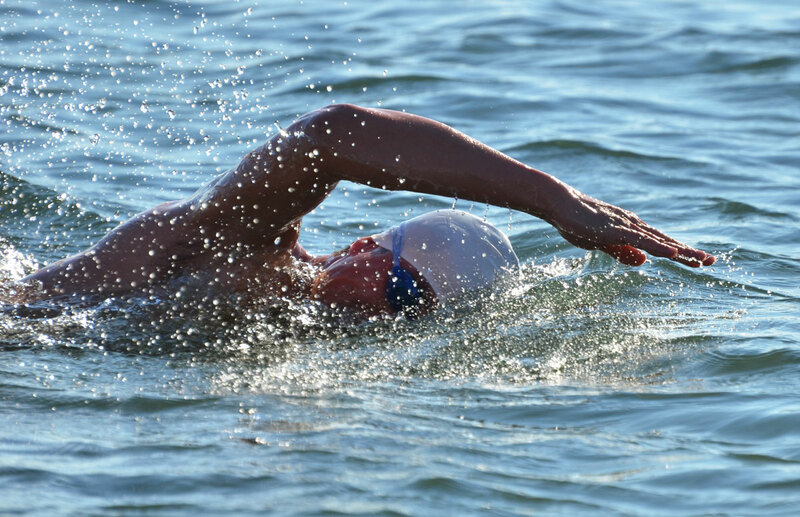 The Keating Channel will remain, but the area south of it is slated to be changed. In the middle is the GFL (garbage collection) transfer station. The low reddish brown building was a recycling facility. It was the site of a fire a few months back and most of the south end sustained substantial damage. 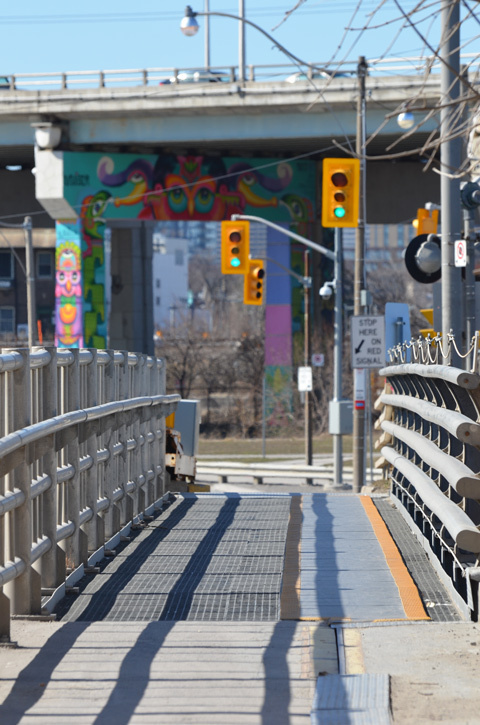 Access to the western portion of the port lands is via the Cherry Street bridge. 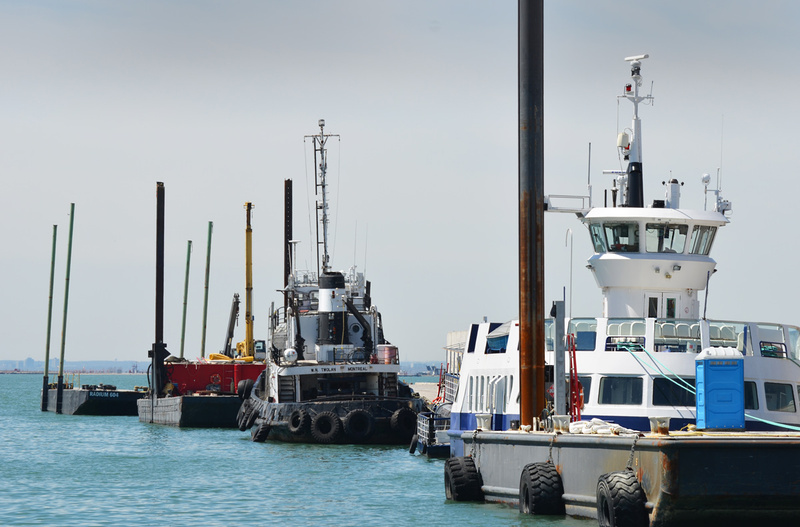 below: Here it is being lifted to allow a boat to pass through the Keating Channel. This bridge was built in 1968 and is at least the fourth bridge at this location. below: In 1900 a wood swing bridge was built with just a single railway track that was operated by the Grand Trunk Railway. There are still remnants of the tracks that serviced the industries located in the area. 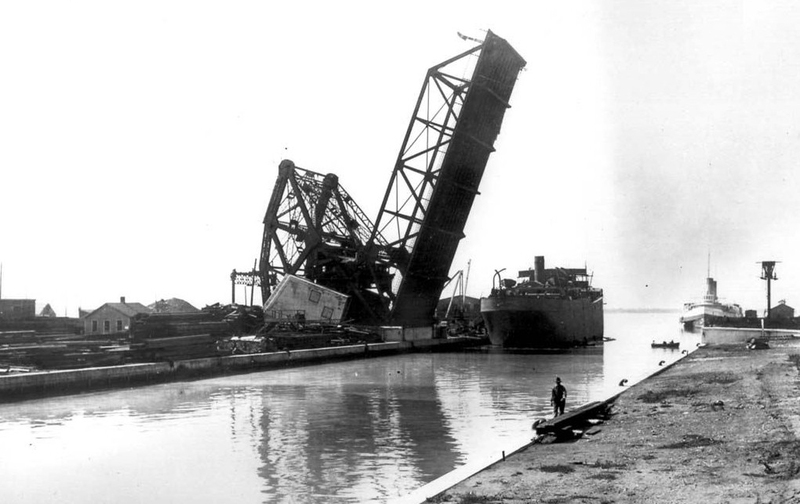 below: Two steel drawbridges were subsequently built here, one in 1912 and one in 1932. 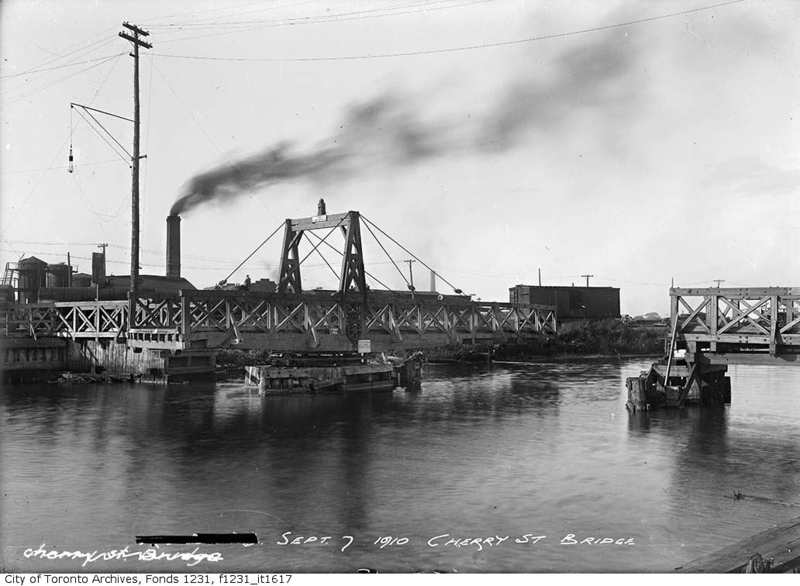 This is a circa 1915 photo of the lift bridge at Cherry Street. 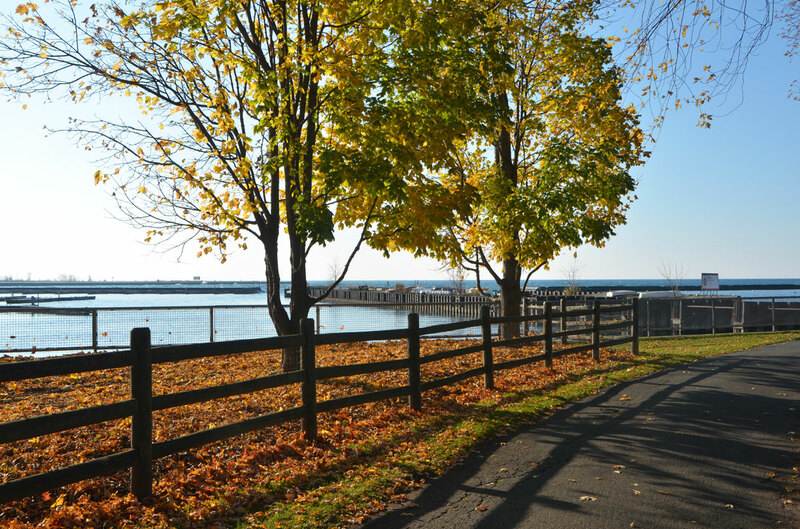 The plans for the redevelopment of this area show that the south end of Cherry Street will be moved to west of its present location – the jog in Cherry where it joins the Lakeshore for a short distance will be eliminated. 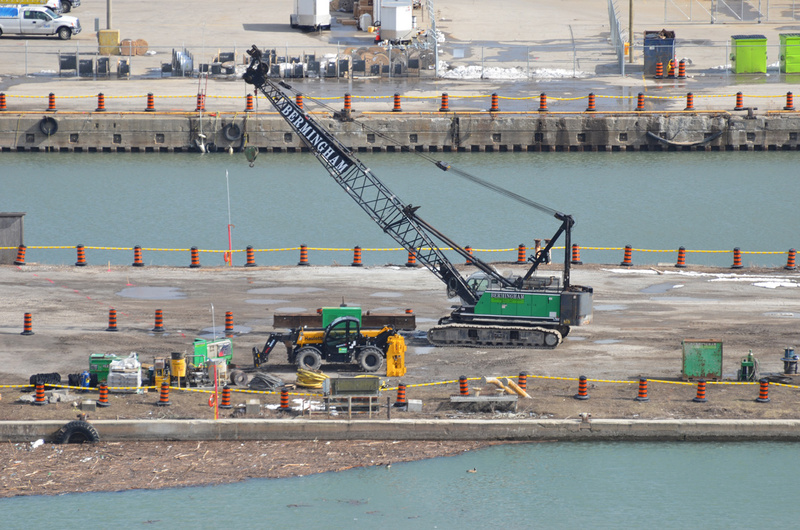 below: This is a close up shot of Essroc Quay at approximately the new location of the new Cherry Street bridge. The Keating Channel is in the foreground. This quay, and the water channel behind it, will be turned into wetlands and parkland. Essroc is a landfilled pier and is publicly owned as is Cousins Quay (the one behind it with the GFL transfer station). below: A new fence too. 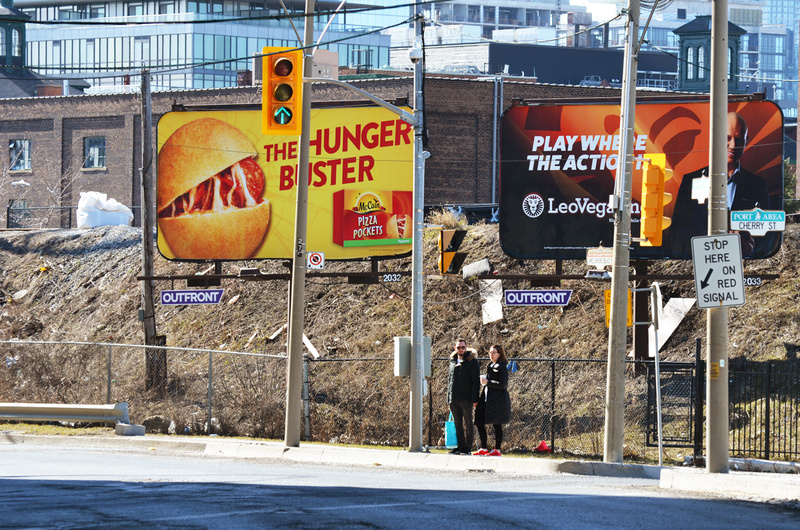 There are many reasons for rerouting the Don River. 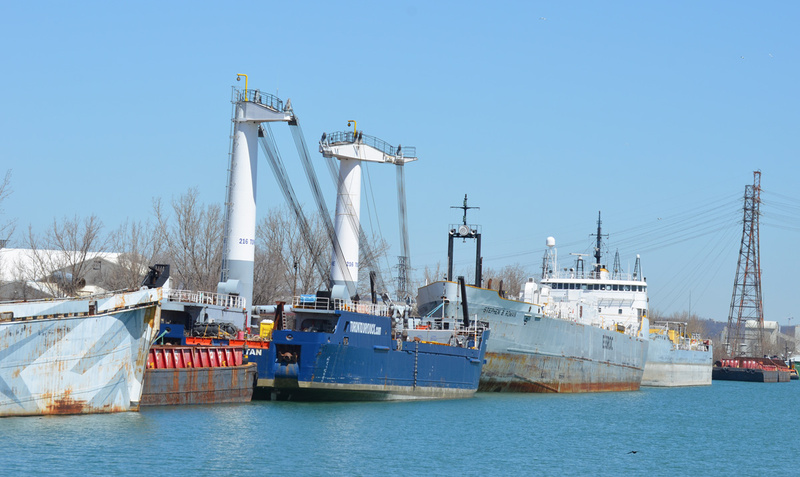 The Port Lands are no longer used by many industries, land use has changed. As the city grows and changes, this area has become prime real estate but it is also a flood plain. 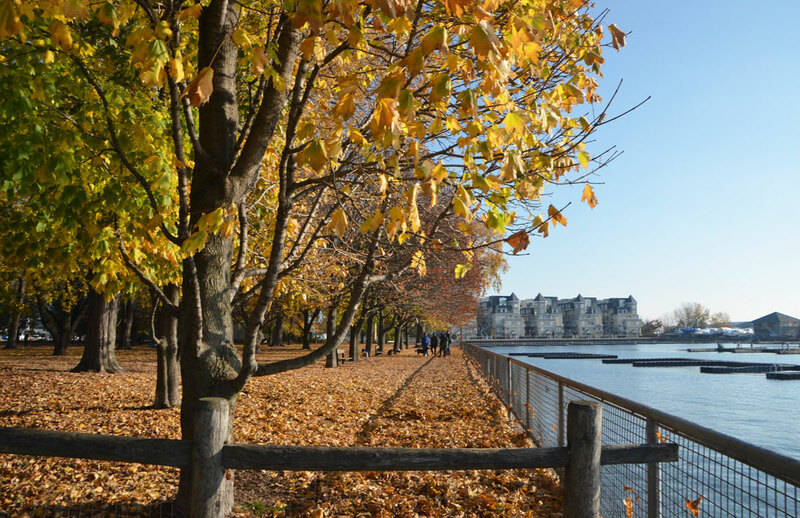 Before any development can occur, flood control measures need to be taken. 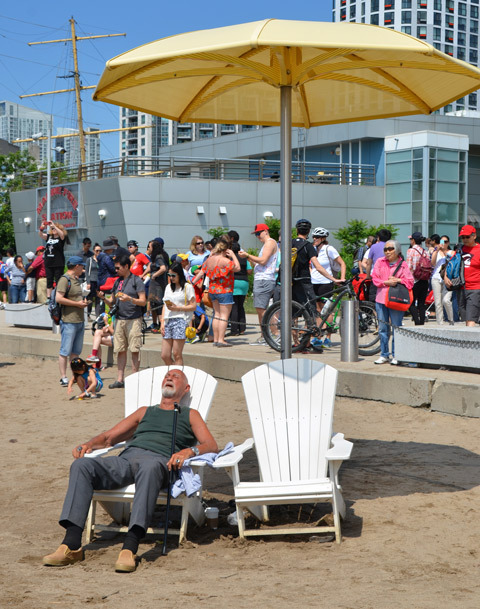 The Cherry Street Stormwater and Lakefilling project will stabilize the local shoreline, protect land from flooding, and create a new landmass to begin the re-naturalization of the Don River’s mouth. The river would be re-routed through the middle of the Lower Don Lands between the Keating Channel and the Ship Channel. 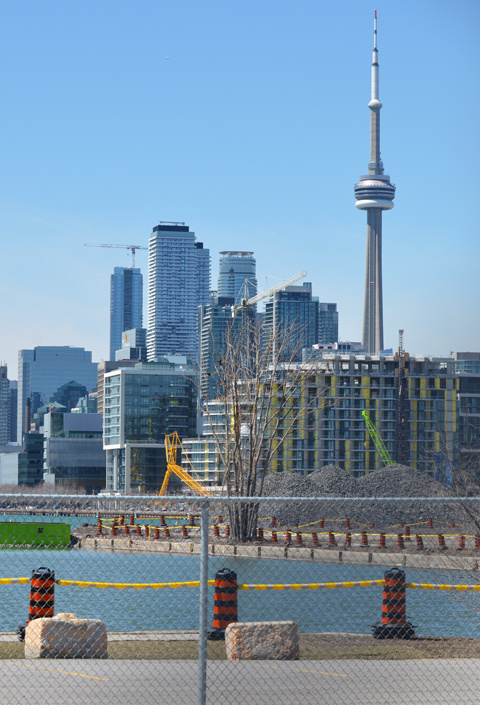 The area being filled will become part of ‘Promontory Park’, a new major green space across the harbour from Toronto’s skyline. The project will also allow for a realignment of Cherry Street so that it no longer merges with Lakeshore for a short distance. At the moment, the Cherry street and Lakeshore Blvd intersection is problematic, especially for pedestrians. Once upon a time there wasn’t much reason for people to walk there I guess. Now, if you are on the wrong side (the west side) of Cherry street, you get stranded at Lakeshore. The Keating Channel isn’t exactly beautiful. 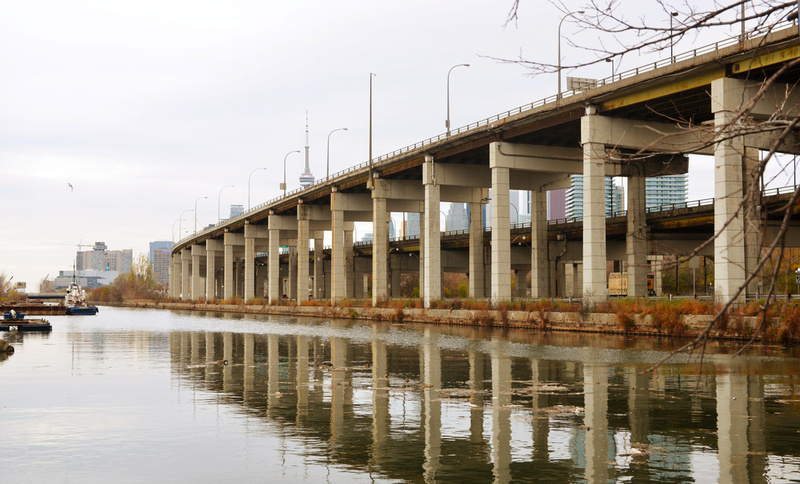 Lakeshore Blvd and the Gardiner Expressway run along the north shore of the channel. There has been discussion & debate about the fate of these roads but so far nothing has changed. 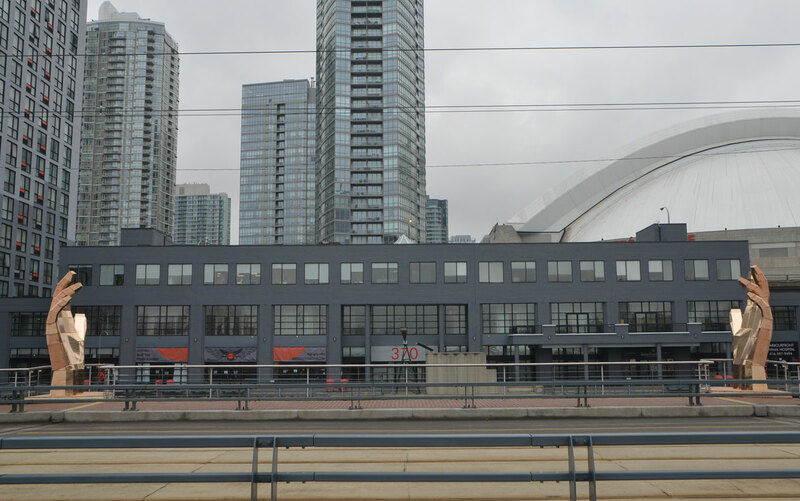 Will they demolish this section of the elevated Gardiner? Or won’t they? (Probably not). 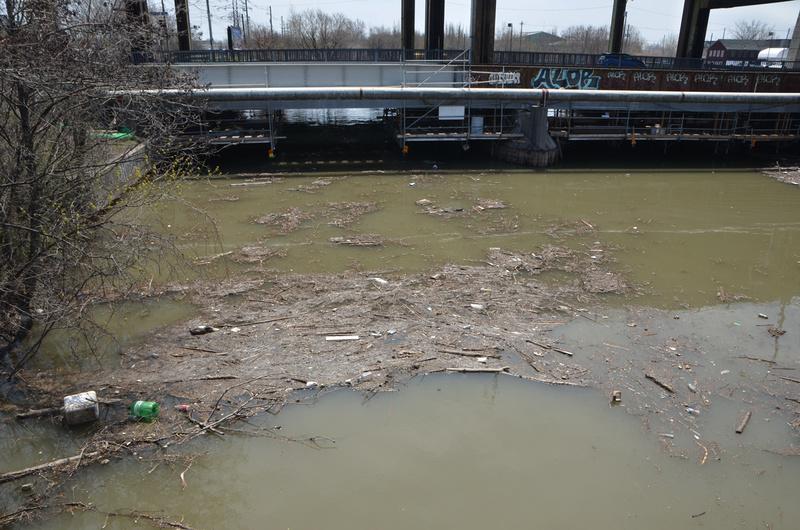 below: The very south end of the Don River at the moment. Not much to get excited about is it? It looks like there is work being done under the bridge? (something’s happening there but I don’t know what). Hopefully it will look better in a few years. The Ship Channel is south of the proposed changes described above. 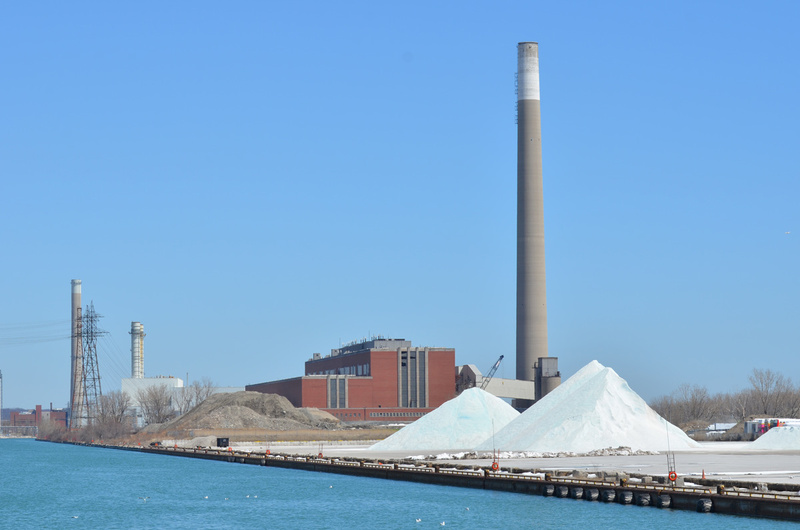 below: Piles of salt on the south side of Ship Channel. These arrive by ship. 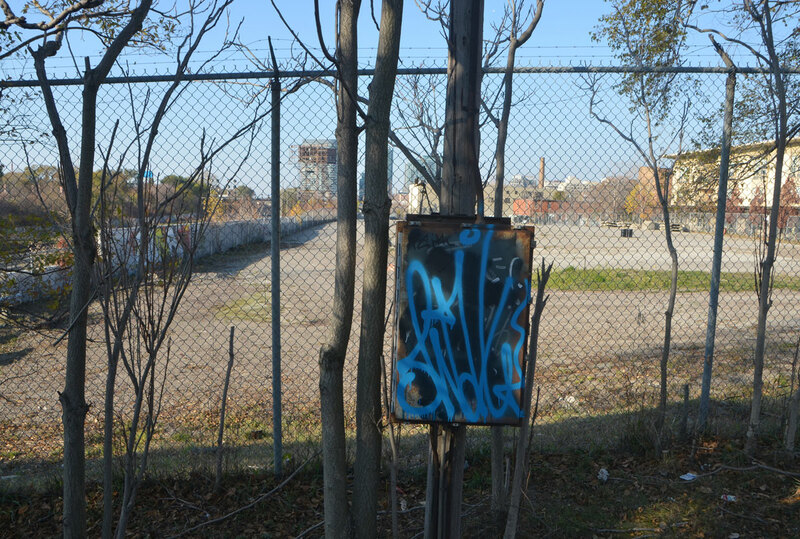 The old Hearn Generating Station is in the background. 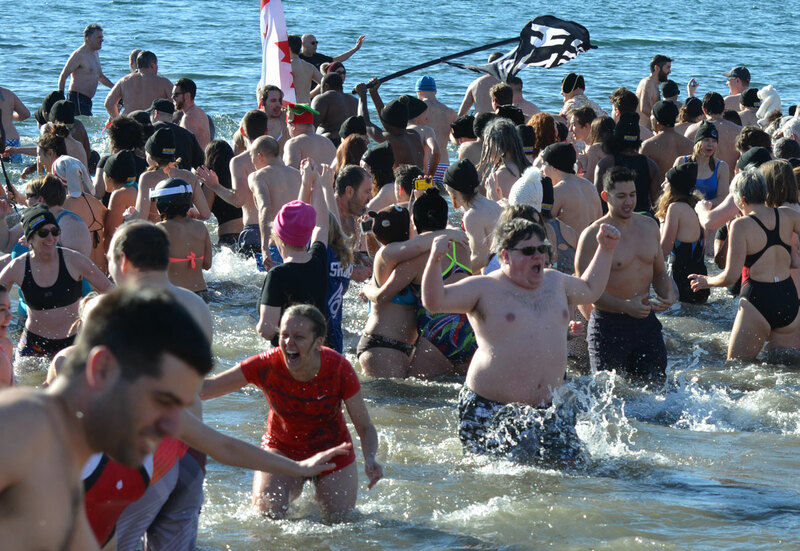 And south of it all, Cherry Beach. Maybe you thought that the duck was a waste of money or maybe you thought the duck was a fantastic idea. 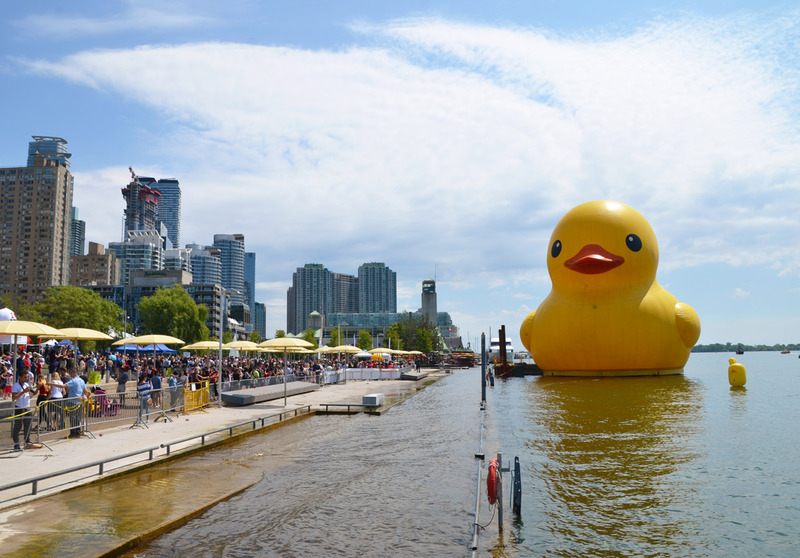 Maybe you didn’t like the duck because it wasn’t Canadian enough for a Canada Day celebration (the Canaduck!) or maybe you didn’t care about such things. It certainly generated a lot of discussion even before it arrived – who hasn’t heard about the duck? Who didn’t have an opinion about the duck? It spawned the hashtag #whattheduck, a play on WTF. The noise has now all died down. The 150th birthday party is over. 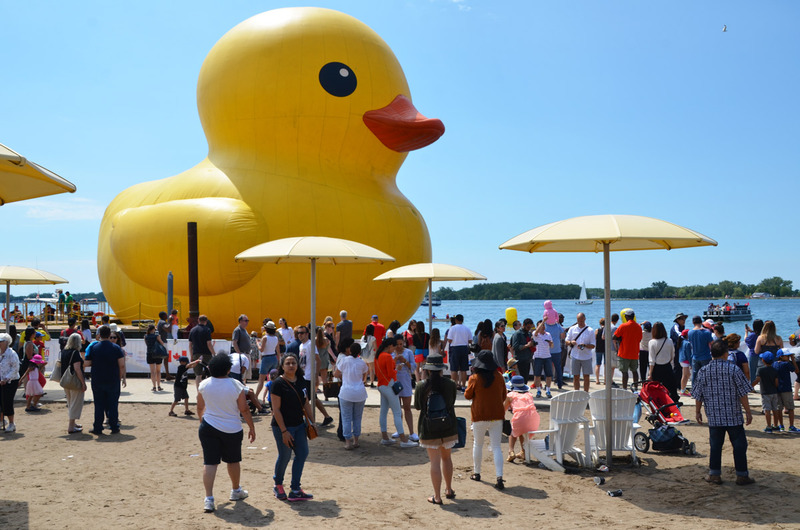 I don’t think that I am alone in thinking that the duck was the star of the Redpath Waterfront Festival and that the festival organizers have no regrets about spending the money on the duck. 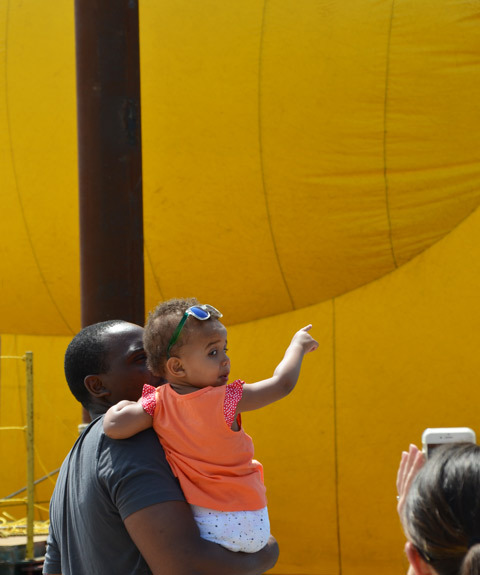 below: The yellow duck was moored by HTO beach (that’s the one with the yellow umbrellas) for the duration of the July 1st long weekend. It smiled through rain and shine. 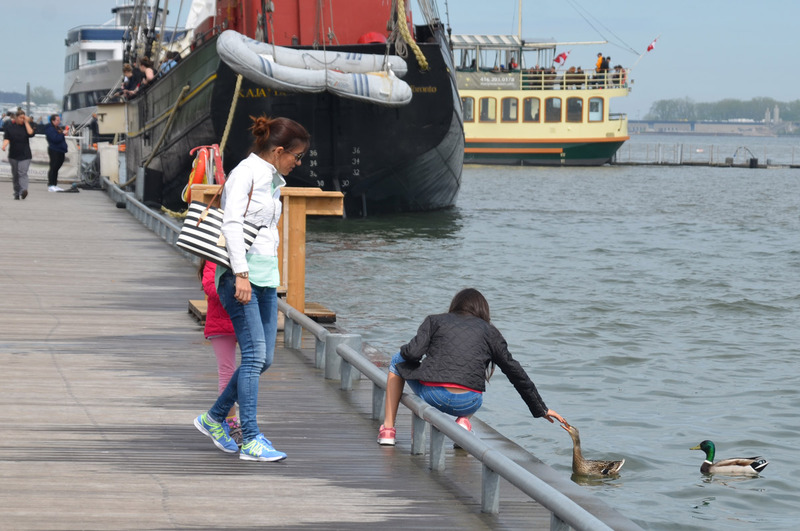 below: It was a popular duck and it attracted about a million people. 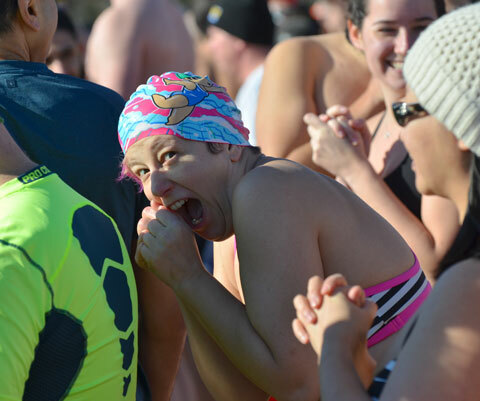 People of all ages. 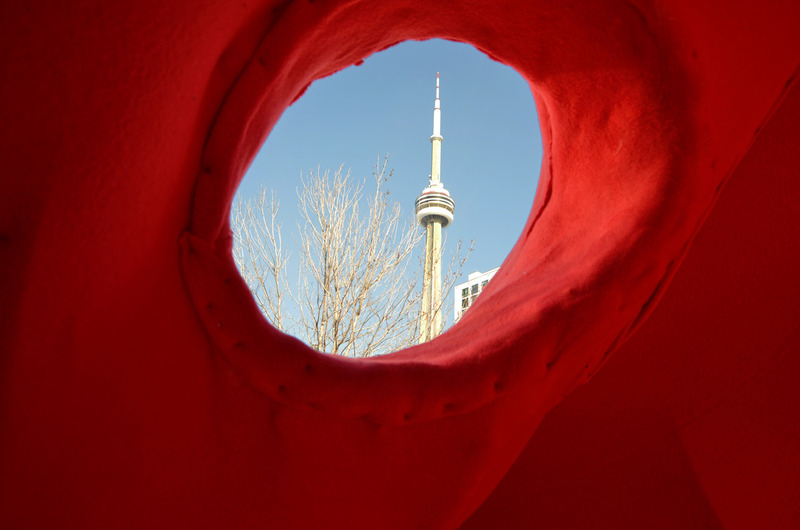 It was about 6 storeys tall so even if you couldn’t get close to it, you could still get a good view. 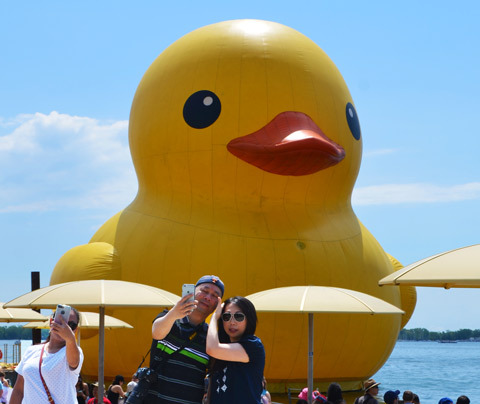 below: Millions of photos were taken with (and of) the duck. It was a willing subject and it stayed still – it was good at holding a pose. The trick was to get a selfie that didn’t have lots of other people in it! 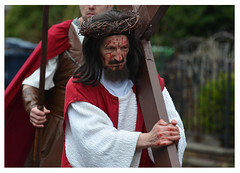 He was a bit grubby – maybe too big for a bathtub? – but no one cared. 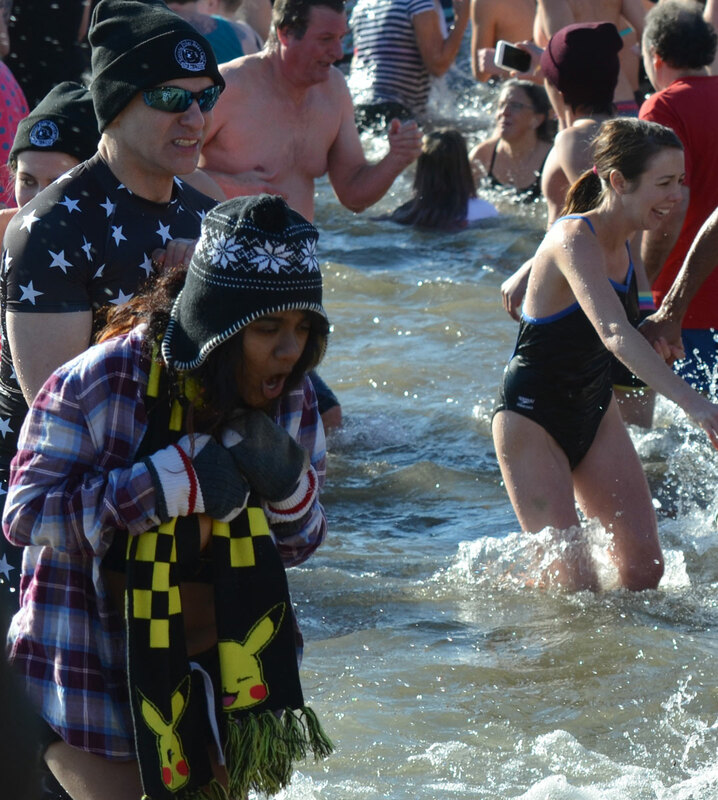 below: Not everyone was excited to see the duck! 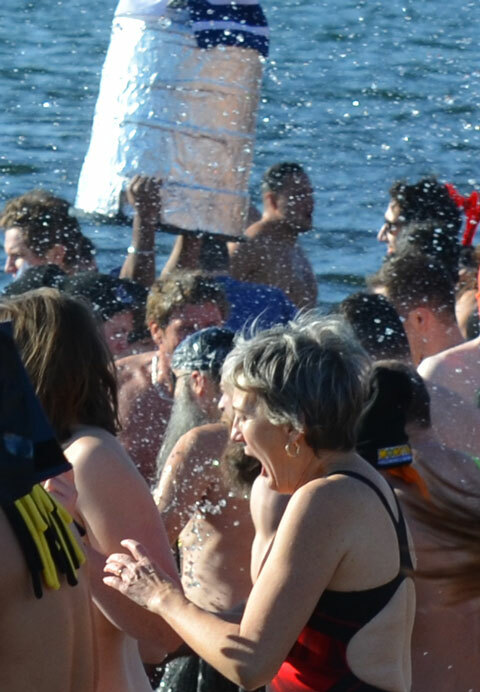 below: One last look at the duck. 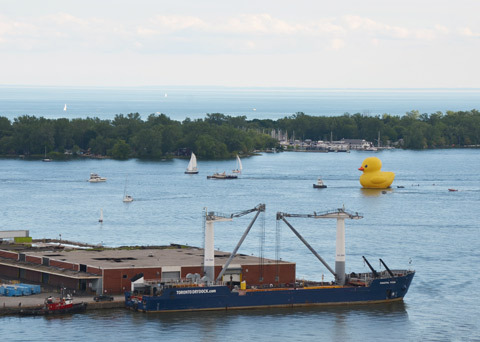 On Monday evening the duck was towed across Toronto Harbour to the Port Lands where it was deflated and readied to be sent to Owen Sound for the next port of call on its Ontario tour. 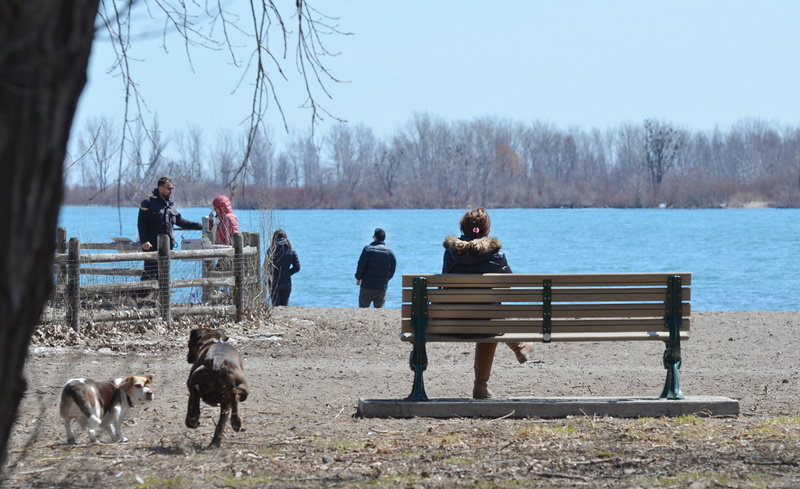 The water levels in Lake Ontario are higher than normal this spring – some beaches are under water and a large percent of the Toronto Islands are flooded. 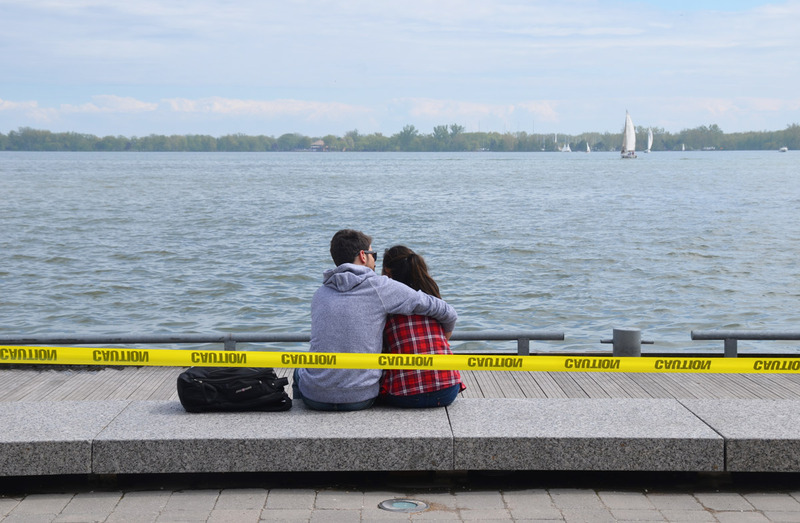 In front of the Power Plant Art Gallery the water level is even with with the concrete walkway… but not high enough to deter people from enjoying the waterfront this past weekend. 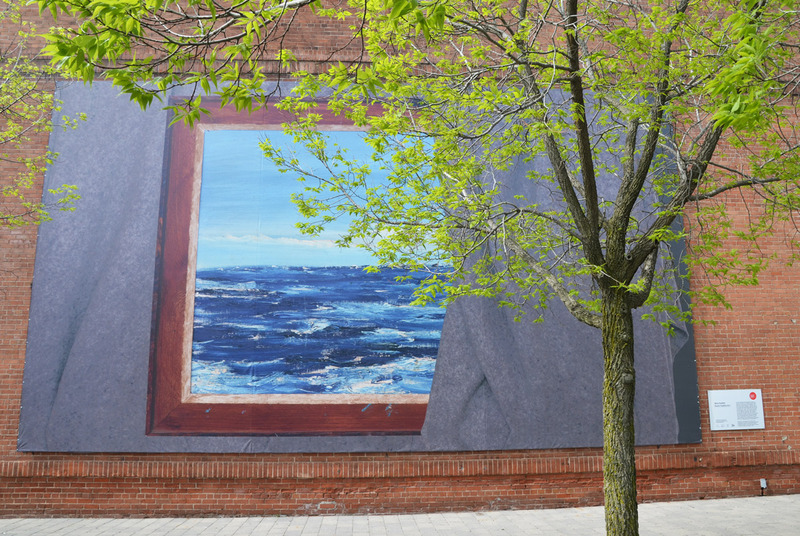 It seems appropriate that the artwork on the exterior wall (facing the lake) of the Power Plant features an image of water – white crested waves on a large lake. 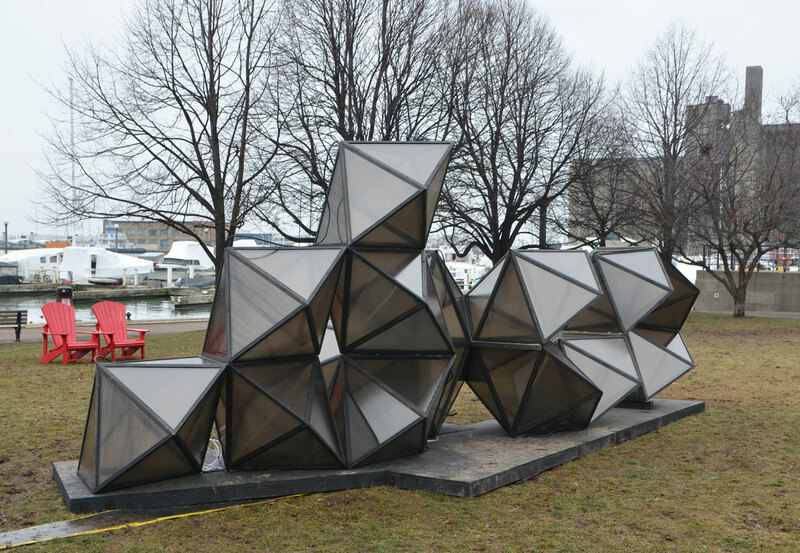 The piece is “Bound, Hupfield 2017” by Maria Hupfield; it is 19 feet high and 31 feet wide. The central image is a seascape painted by the artist’s mother, Peggy Miller, many years ago. It is being wrapped (unwrapped?) with grey felt-like material. 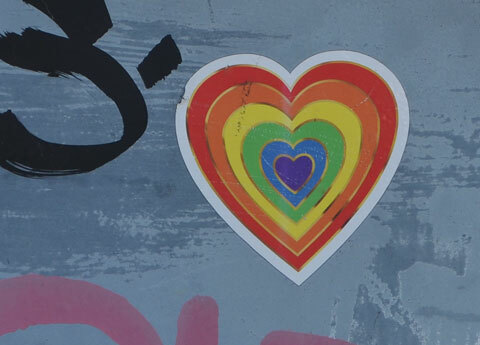 Is it a treasured artwork that is being readied for storage? 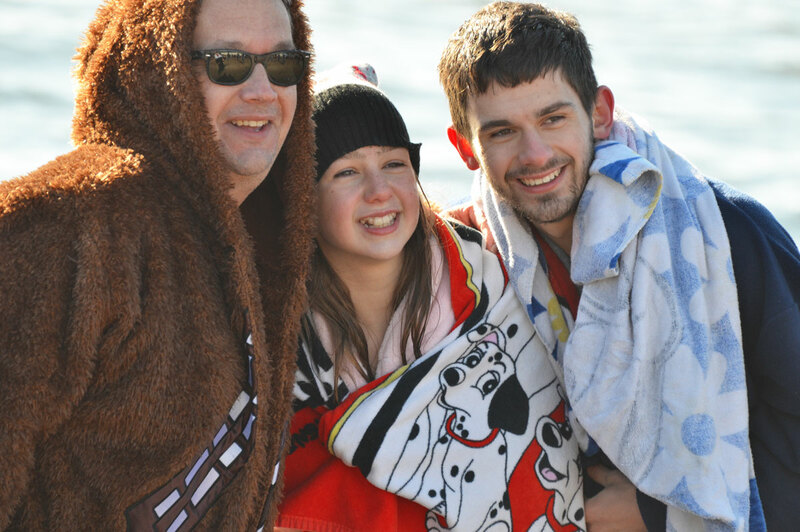 Is it a painful memory that is being covered up to be forgotten? Is it a family heirloom that is being brought out for someone to admire? 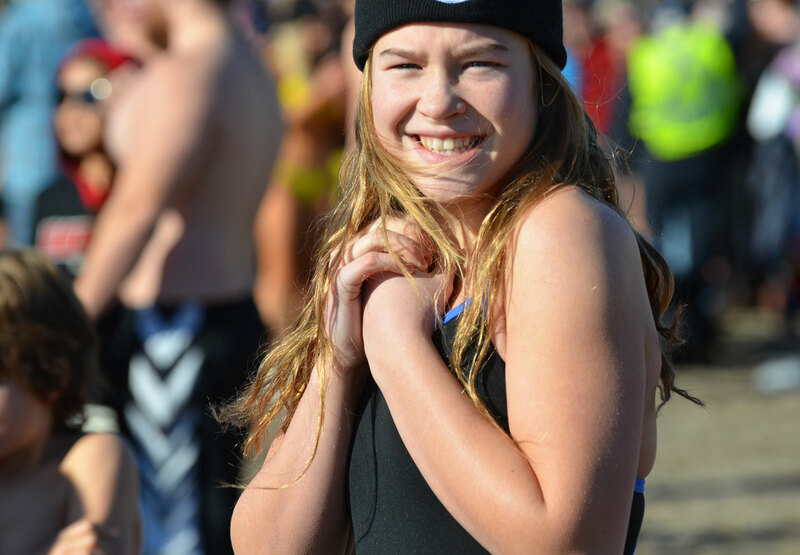 If you are interested in more information about Maria Hupfield, check the CONTACT website. 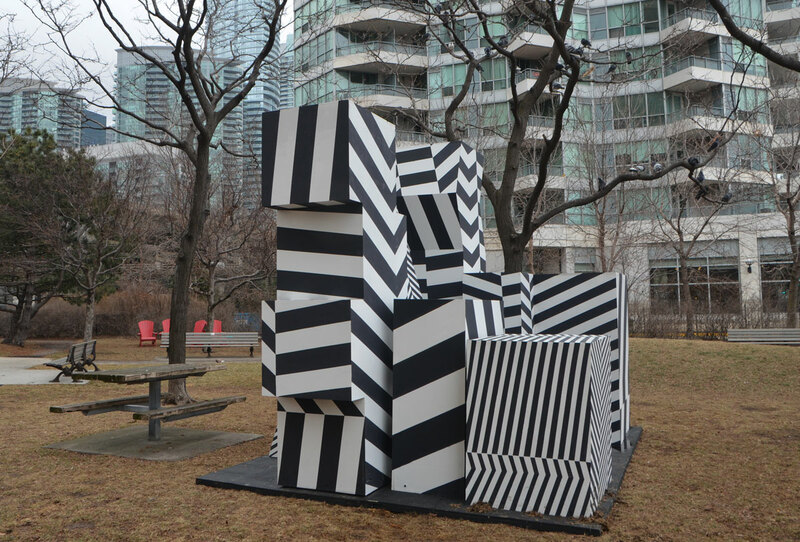 below: The first installation that I saw was ‘Incognito’ which stands out in Rees Street Parkette on Queens Quay. It is by Curio Art Consultancy and Jaspal Riyait. below: Set your sails and round you go! 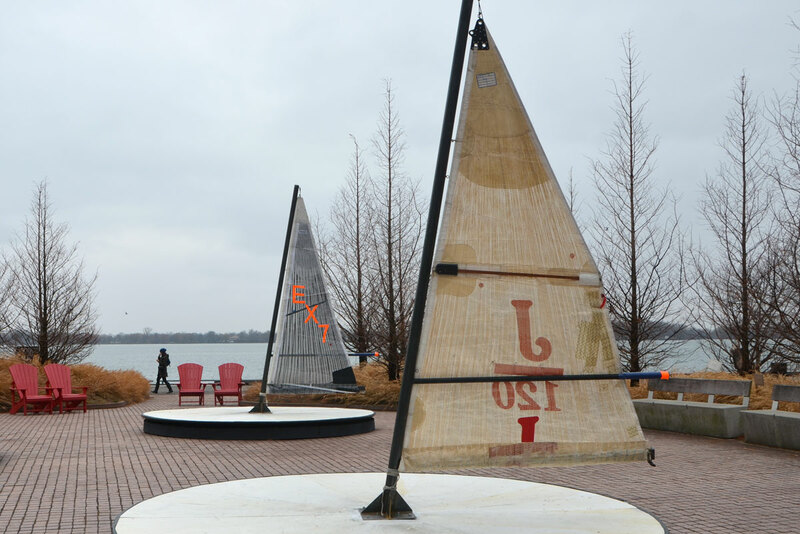 Sailboats that go in circles. 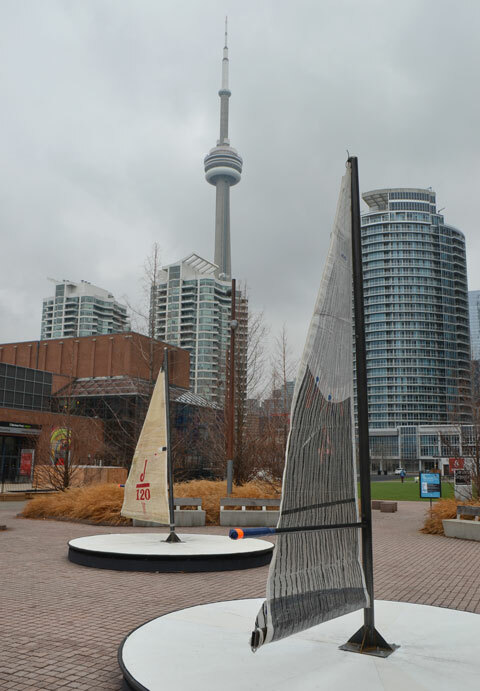 ‘Leeward Fleet’ by RAW design sailing at Canada Square. 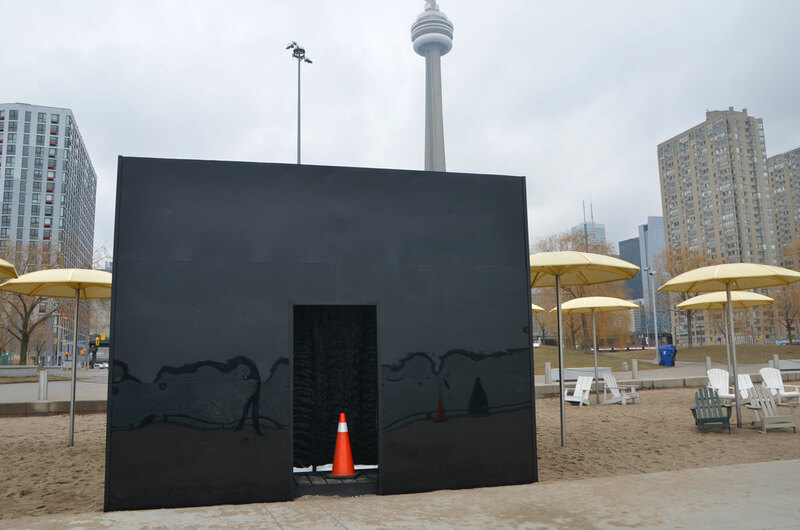 below: ‘Icebox ‘ is a black box on HTO beach which is where the yellow umbrellas are. Alan and Alex of Anex Works were putting the finishing touches on it when I walked by. Polymetis designed it, but Anex Works built it. 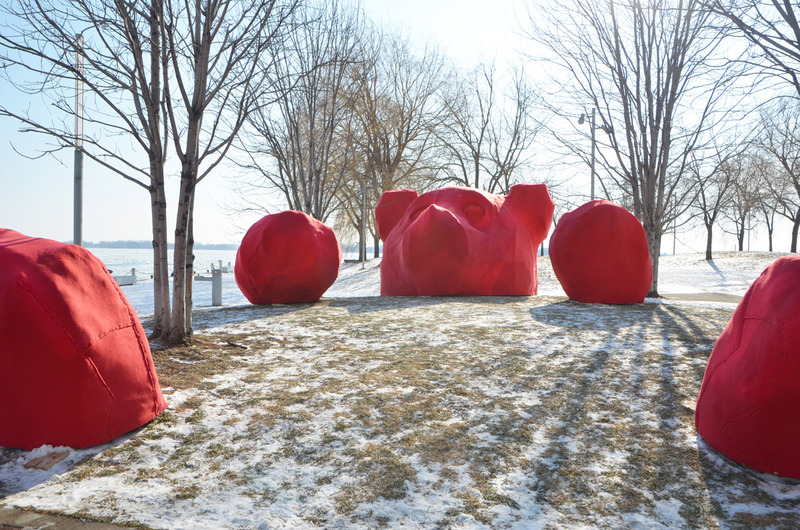 In fact, they are the ones responsible for construction of most of these installations. I didn’t take any photos inside the box in part because it’s not complete… but the inside walls are made from hardened spray foam insulation and that’s all I’m going to tell you. This one will be more fun if it’s a surprise. I definitely plan to go back later in the month to check out the finished product. 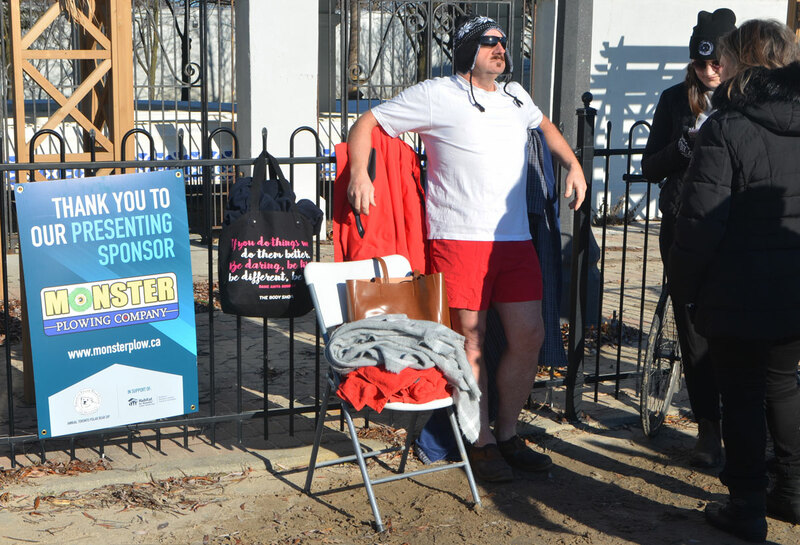 And yes, it is reminiscent of the black box that was one of the Warming Stations in 2015, Hot Box, because it was the same artist (or group of artists). Or perhaps they are holding that grey building up? 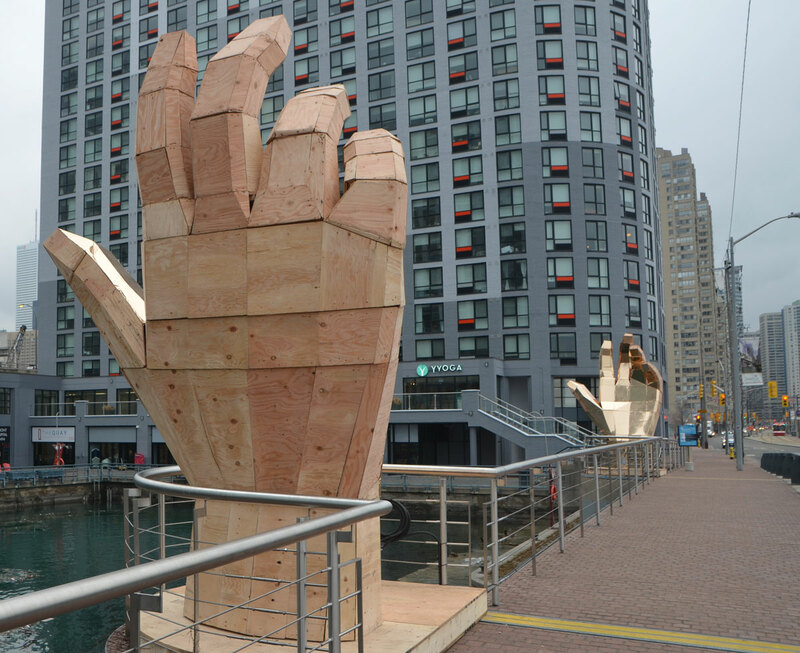 below: The hands are made of wood. The palms are covered in a shiny gold coloured material that will reflect the light that shines from the bottom of each hand. “Tailored Twins” by Ferris + Associates. 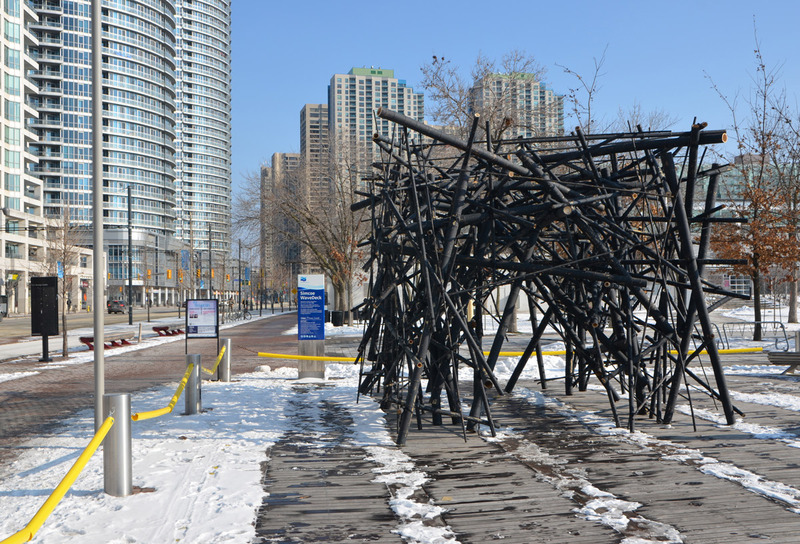 Note: Winter Stations returns to Balmy, Kew and Ashbridges Bay beaches on the 20th of February. Did you do something lazy like sleep in and then stay in your jammies all day? 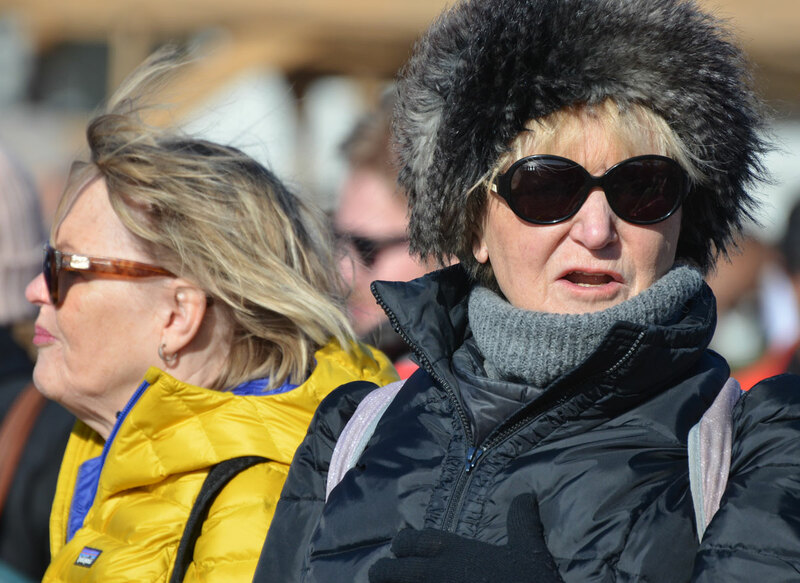 Did you stay home and stay warm? I know a few people that did just the opposite! 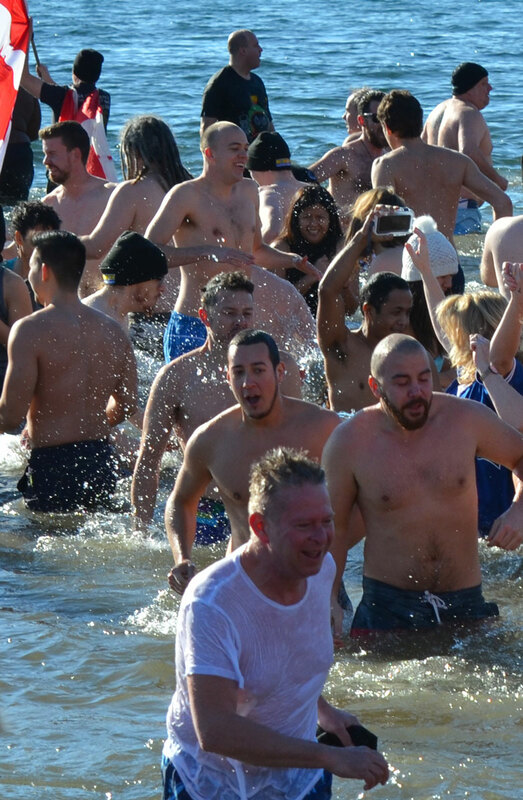 More than 60 people took the plunge and got wet, frigid cold wet that is. 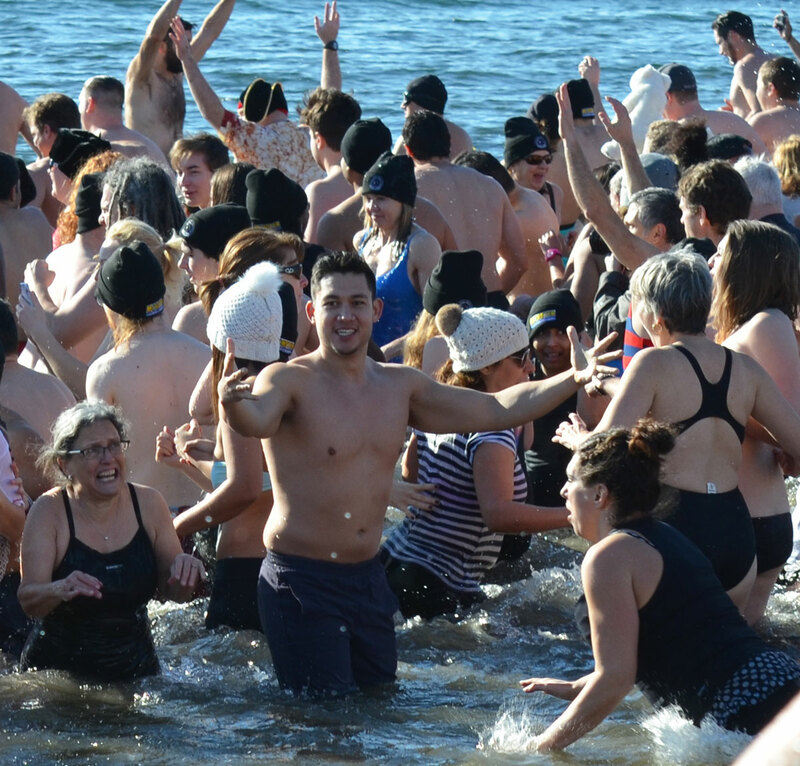 The 12th annual Polar Bear dip at Sunnyside Park was well attended this year and these are some of the brave and crazy people who were there (and the less brave and crazy who came to watch, support, and take pictures of the swimmers). 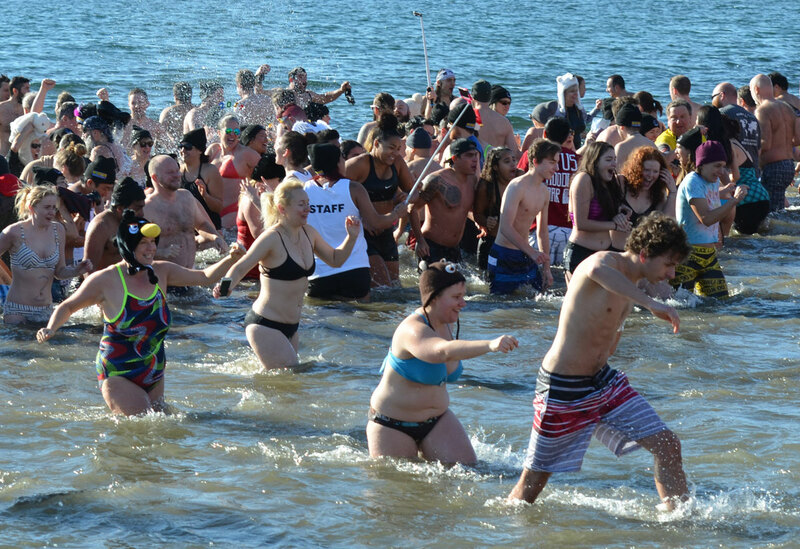 below: The event is a fundraiser for Habitat for Humanity and over $64,000 was raised this year. 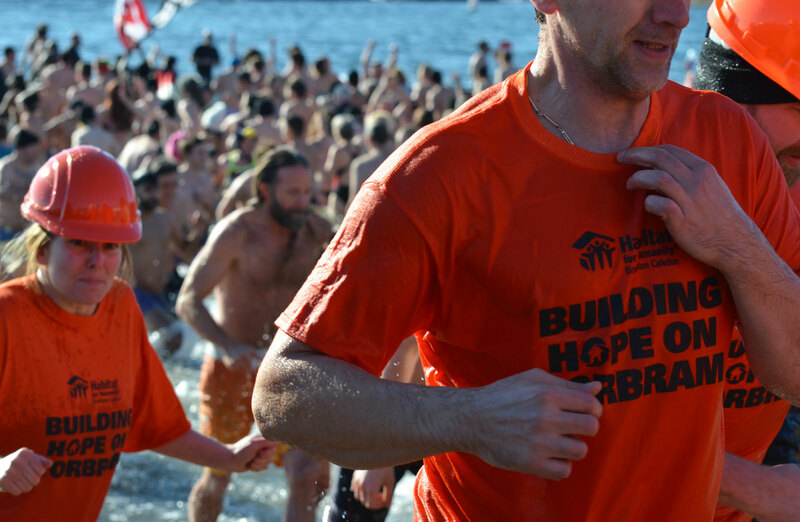 Habitat for Humanity had a team who participated, they could be spotted wearing orange T-shirts and orange hard hats. This is another meandering blog post… a post about being out and about on yet another wonderful autumn day, going wherever my feet and eyes take me. 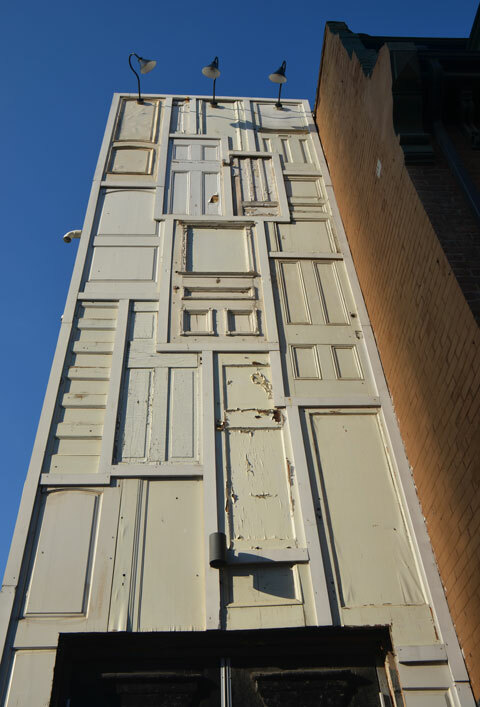 below: The first picture of my day was this intriguing wall made of old wooden doors. 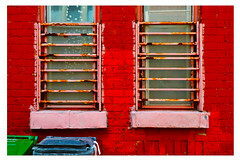 Bathurst Street. 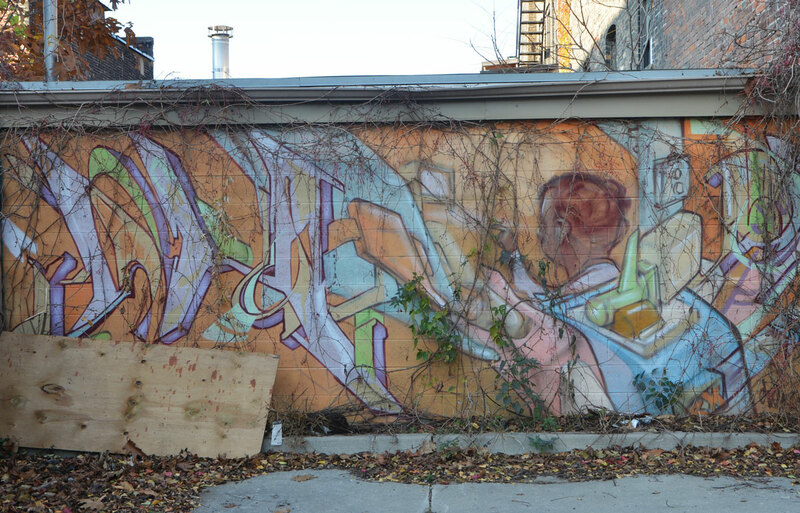 below: A small elicser mural tucked away at the end of a parking lot. The man has his back to the viewer but I can’t figure out what’s behind him or what he might be doing. 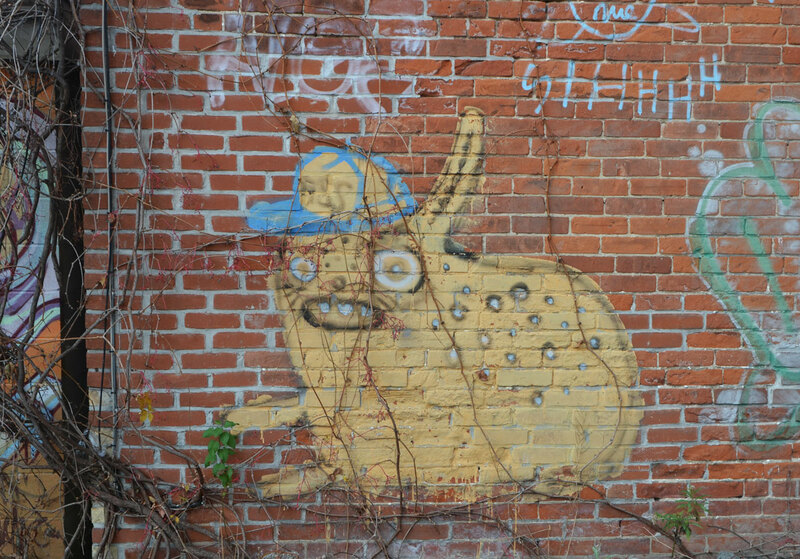 below: The leaves have fallen off the vines to reveal a yellowish creature with his baseball cap askew. 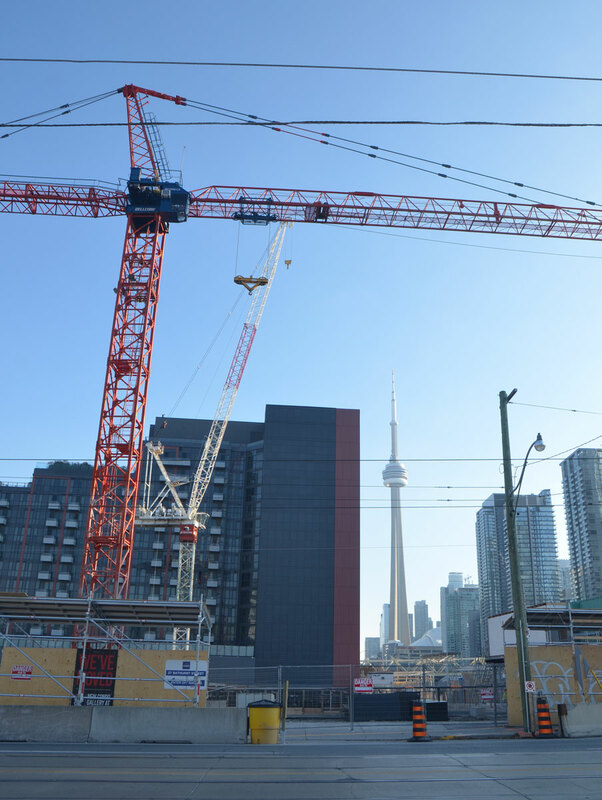 below: Toronto’s tallest icon framed by a construction crane. below: And on a similar note, a vacant lot cleared and ready for the next stage of its life. below: No more cranes here (and not many vacant lots either for that matter). A view showing how much development there has been on the south side of the railway tracks. 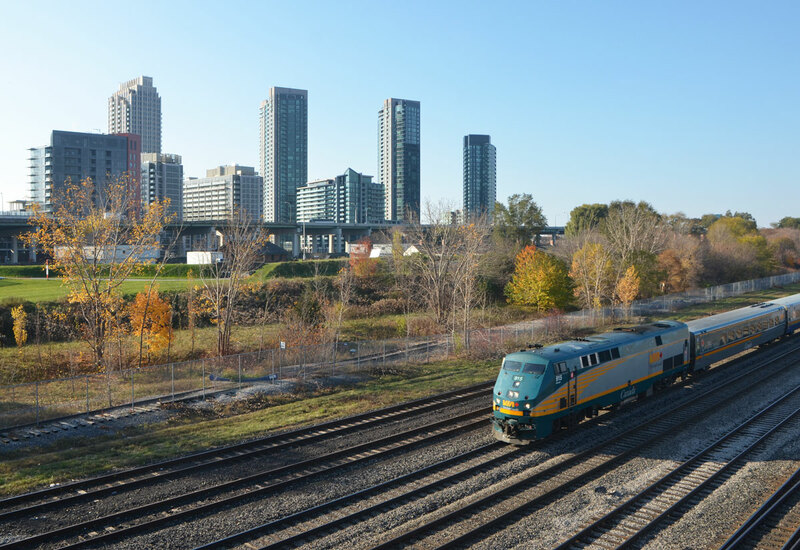 Fort York is between the tracks and the condo towers. below: And what’s this? 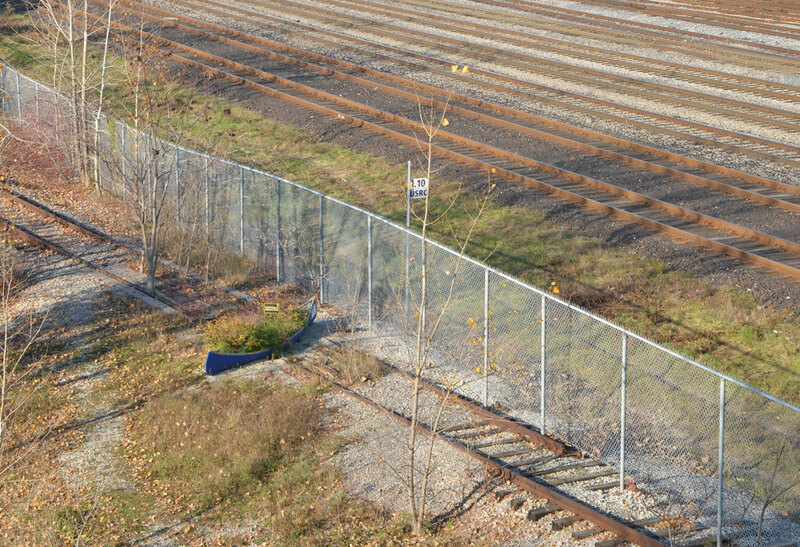 An old blue canoe beached on the tracks? 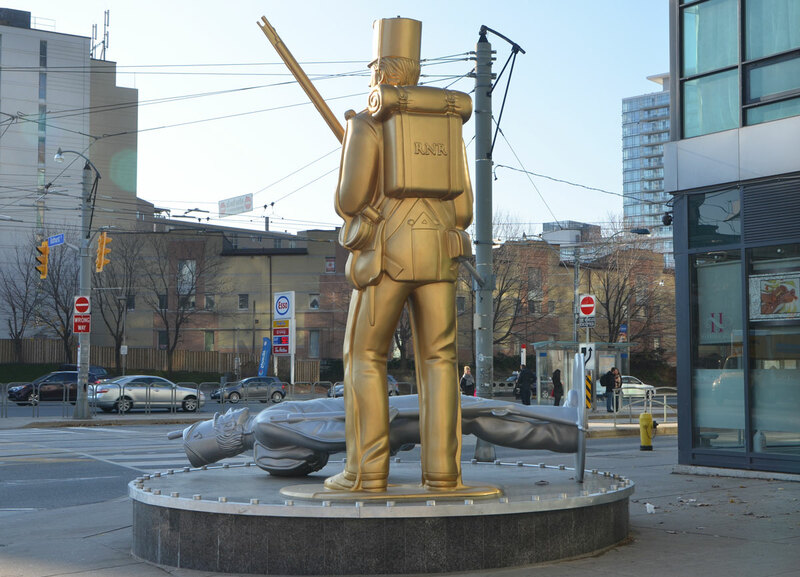 below: Standing guard over Bathurst Street, Fleet street and the Lakeshore, is one larger than life gold replica of a Royal Newfoundland Regiment and his fallen silver American foe. 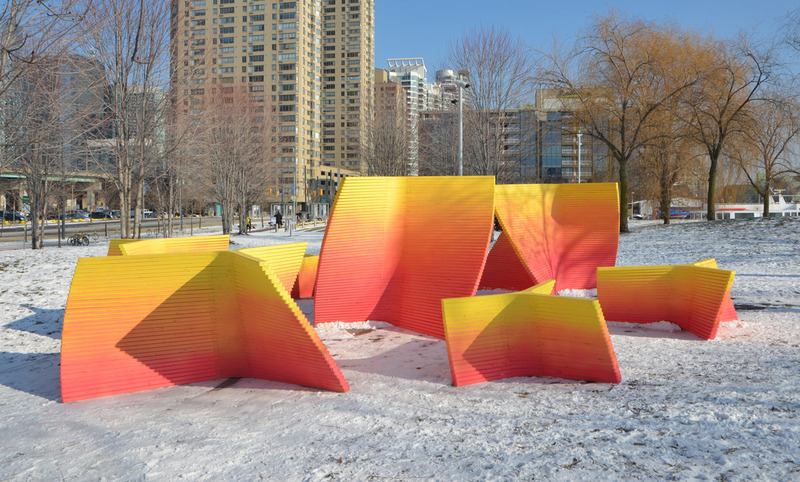 A sculpture by Douglas Copeland entitled “A Monument to the War of 1812”, a nod to nearby Fort York and the history of Toronto. below: My favorite example of bad grammar still exists! 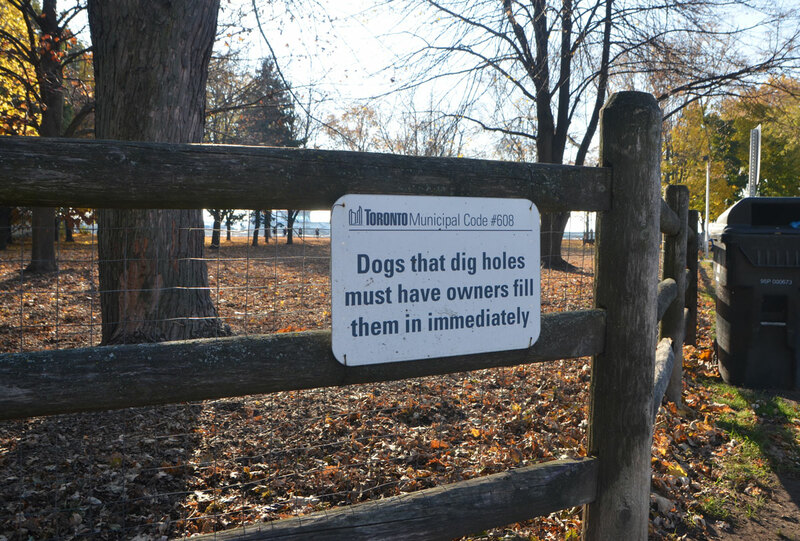 Off-leash dog area at Coronation Park. A beautiful day in the park. A slight November nip was in the air but it was sunny and the sky was a brilliant shade of blue. 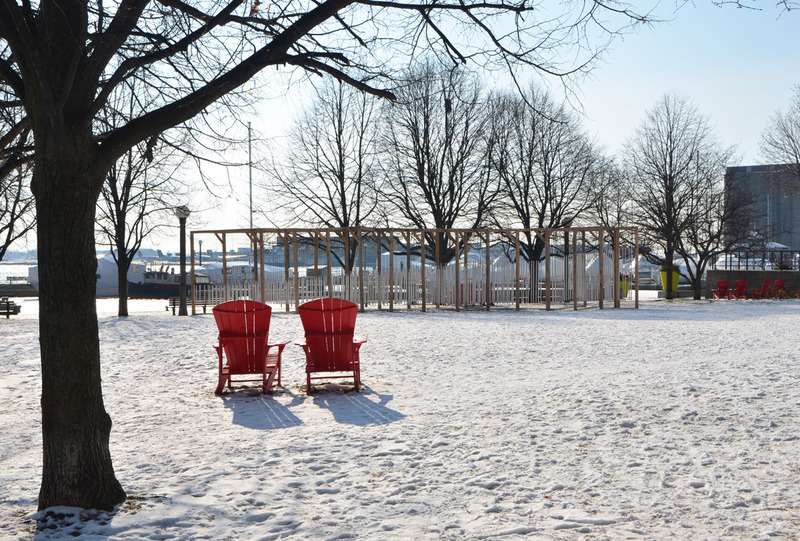 Coronation Park is named in honour of the coronation of King George VI who was crowned on 12 May 1937. At that time nearly 150 trees were planted here. Apparently, an oak tree was planted to honour the king. Surrounding it, a ring of silver maples was planted. This was to symbolize the countries of the British Empire. I wish I had known that bit of trivia before I walked through the park because now I am curious if these trees are still there. Some of the trees are quite substantial. below: Long shadows for the morning sun, low in the sky. below: Looking back towards the city center, past the empty docks of the National Yacht Club to the residences on Stadium Road. 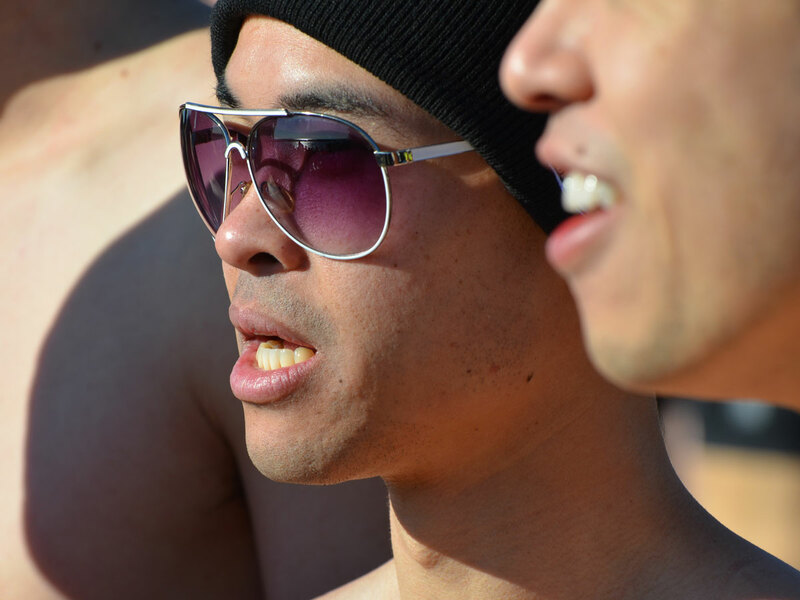 A small group of people were making a video in the dog park. 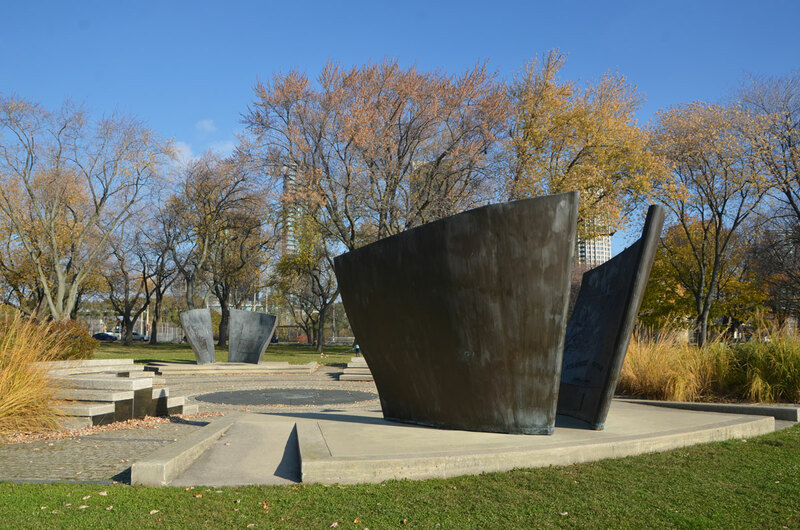 below: This Victory Peace Monument was unveiled on 14 November 1995 to commemorate the 50th anniversary of the end of World War 2 and honour those who died in that war. 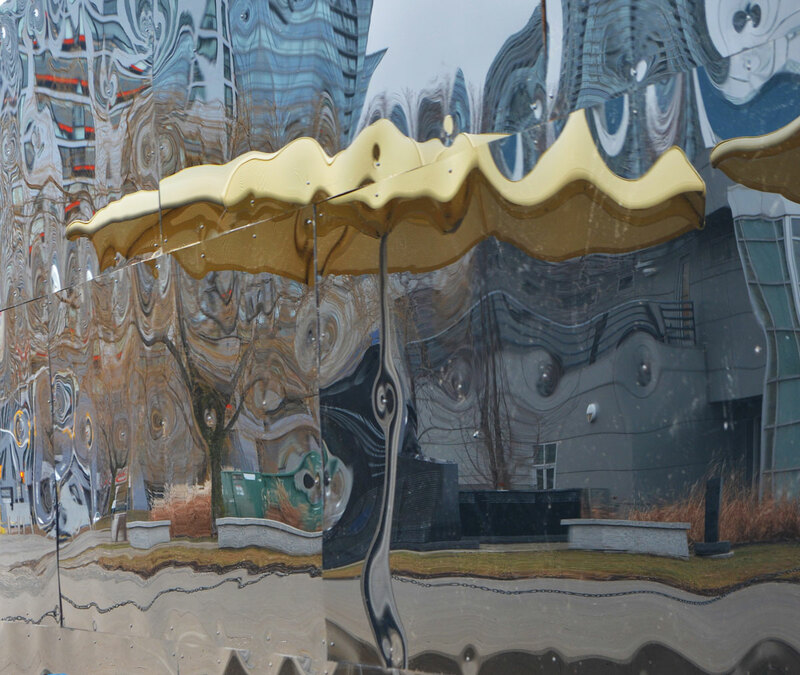 It was designed by John McEwen; the bronze pieces resemble the bow of a ship. 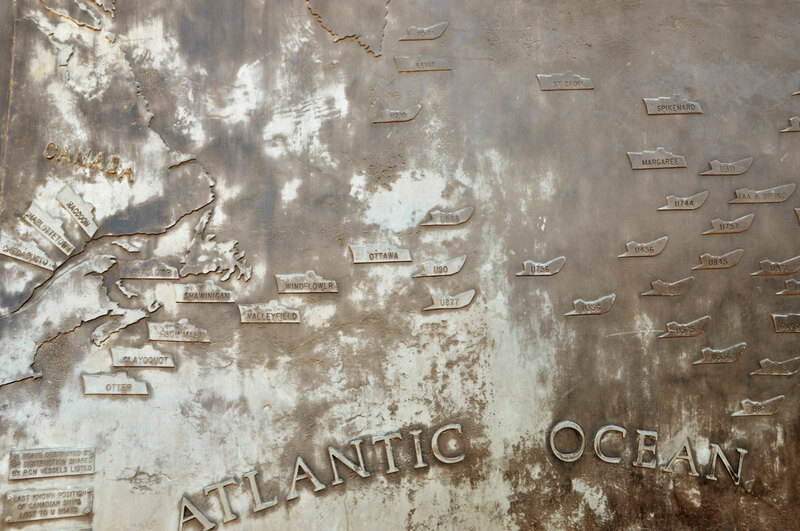 below: On the inside of one of the bronze pieces is a map of eastern Canada and the Atlantic Ocean. Each boat on the map represents a ship or U-boat that was sunk during the war. The Canadian ships are located on the map at “their last known position”. I hadn’t realized that so many ships were lost so close to North America. 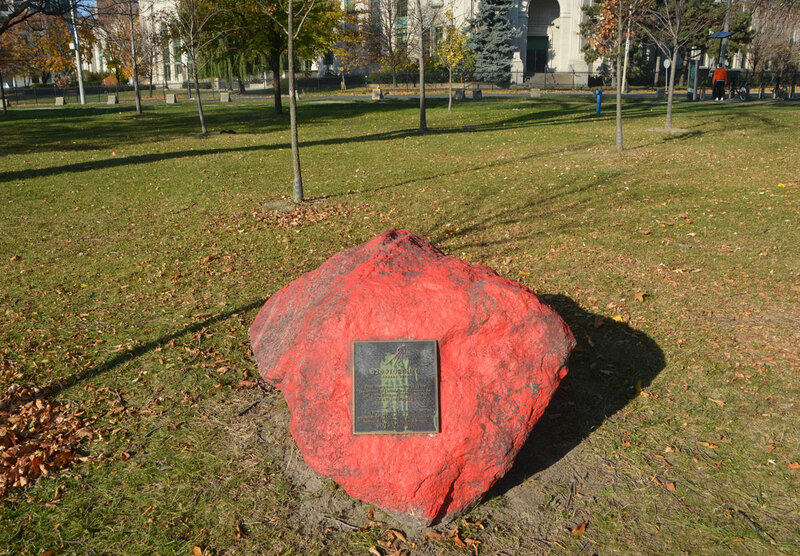 Trees were also planted to represent the four divisions of the Canadian Expeditionary Force (WW1) and its units as well as those who fought in the Fenian Raids of 1866-1870, the Northwest Rebellion of 1885, and the Boer War (1899-1902). 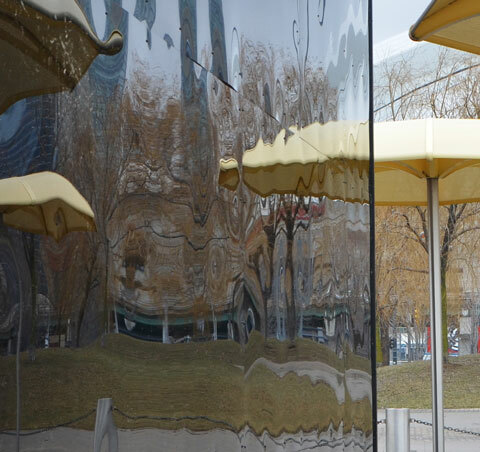 Once upon a time, brass plaques were placed at the foot of each tree to indicate the units the tree stood for. If any plaques remain, I didn’t see them. below: Another memorial is close by, a “Memorial to Lieut. Tommy Hobbs gallant British Canadian soldier in the Great War 1914 – 1918. Died on active service November 10, 1940. Beloved and remembered by his comrades.” Tommy Hobbs was involved in the creation of this park. below: A little farther on I noticed another rock, one that was painted red. 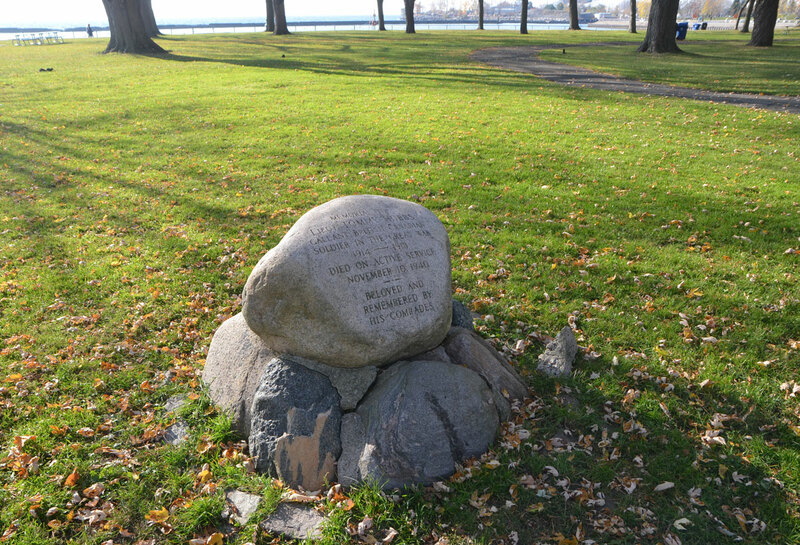 The bronze plaque on the rock says that 20 trees have been planted here in commemoration of the G20 Summit held in Toronto in 2010.
below: A 30 foot tall Inukshuk stands looking out over Lake Ontario. 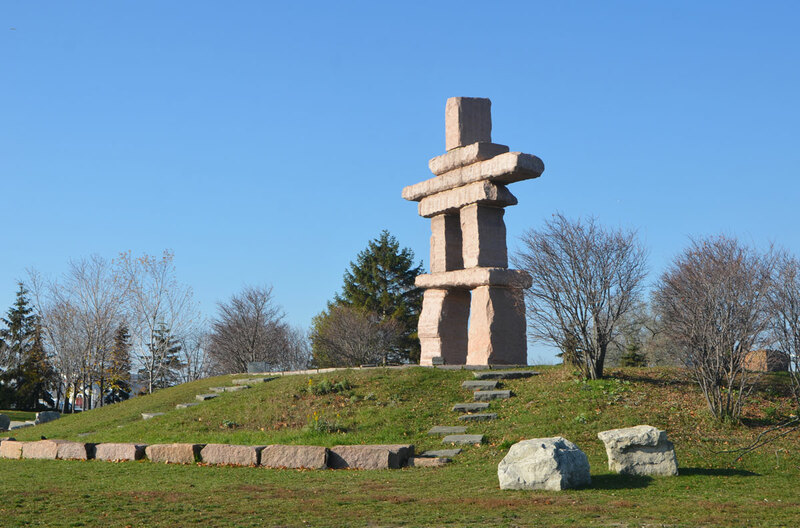 Approximately 50 tonnes of mountain rose granite was used to create the Inukshuk, which was made by Inuit artist Kellypalik Qimirpik from Cape Dorset, Nunavut. 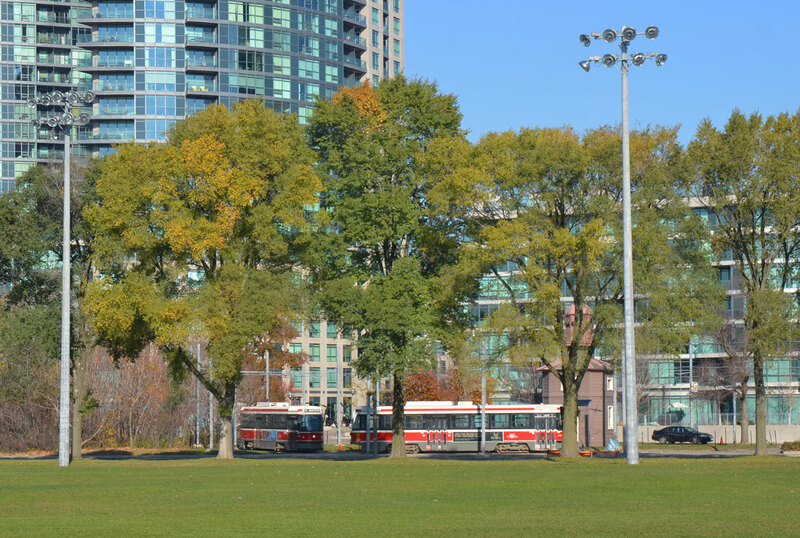 below: Streetcars across the baseball outfield. below: A closer look at that brown octagonal structure in the middle of the streetcar loop for the 509 and 511 cars. Apparently it’s the Queens Wharf lighthouse, one of a pair built in 1861. 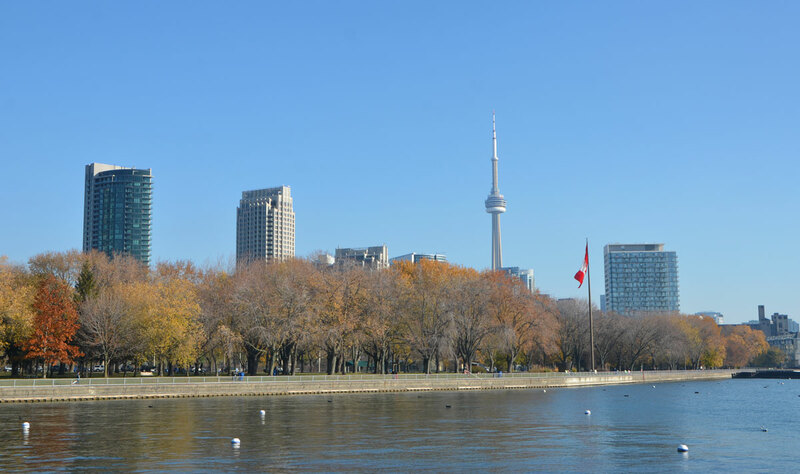 The lighthouses marked the entrance to the Toronto Harbour from 1861 until the Western Channel was built in the early 1900’s. 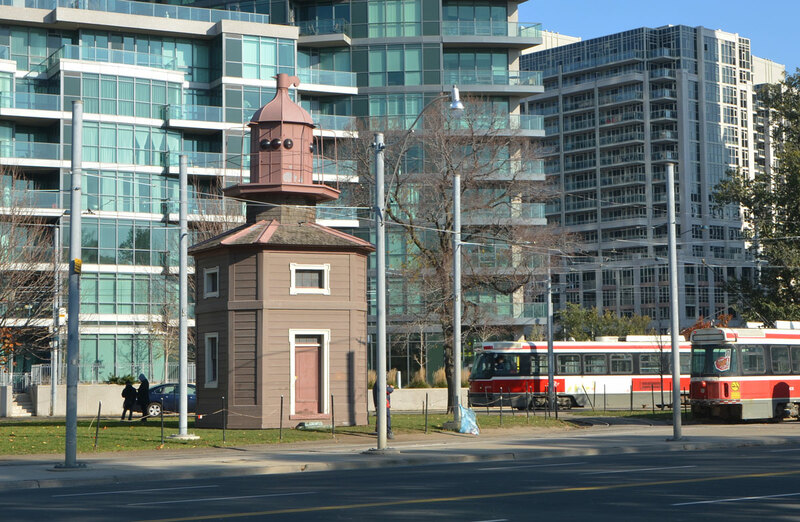 This one stood on Queen’s Wharf which used to be at the foot of Bathurst Street, adjoining Fort York. 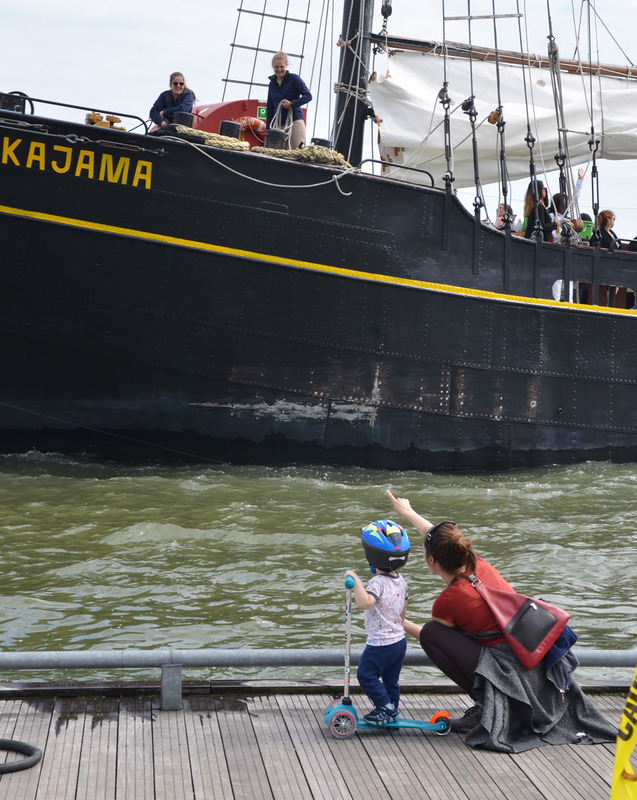 The wharf was built by the military; in 1833 it was a pier 42 feet long. 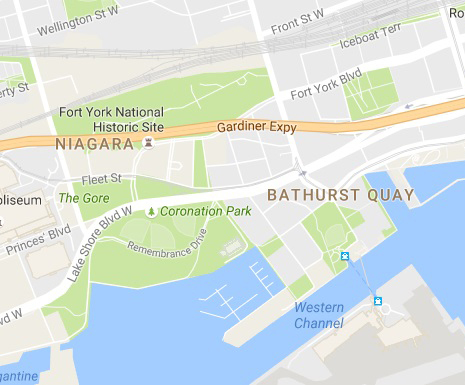 The pier no longer exists; a hundred years ago it was buried under what is now Bathurst Quay. 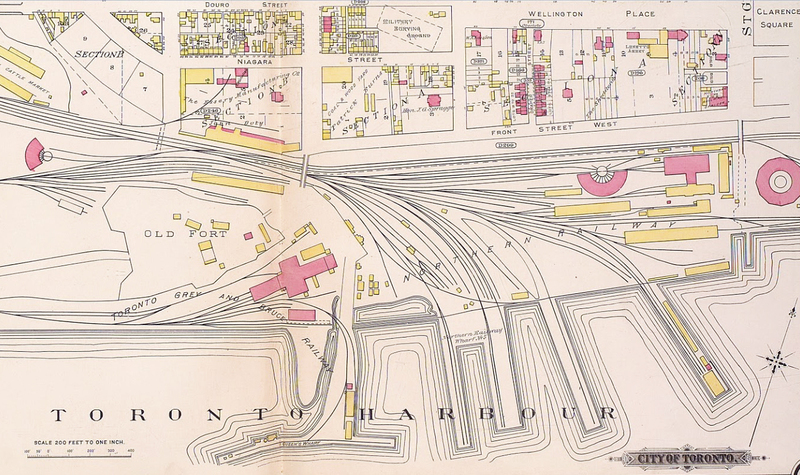 below: A picture of an historical map (1886 or 1887) of the area showing Toronto Harbour, Fort York and the railway lands. Queen’s Wharf is the pier on the left. At that time, Front Street was the southern most street in this part of the city. All the present day development south of the train tracks is on reclaimed land. below: Taken from google maps, what the layout of the city looks like now. As you can see, there have been many changes!